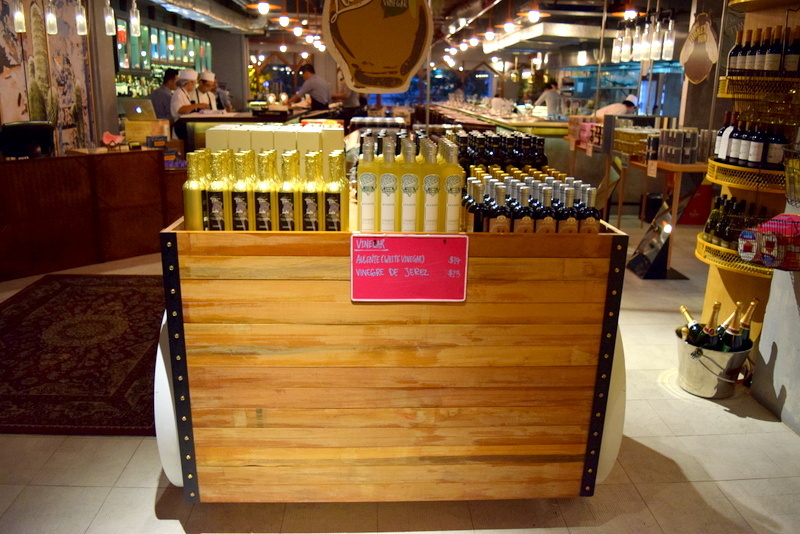 South American (Singapore) – Simply foodolicious! おいしい! 好吃! 맛있는! délicieux! delicioso! 好食! 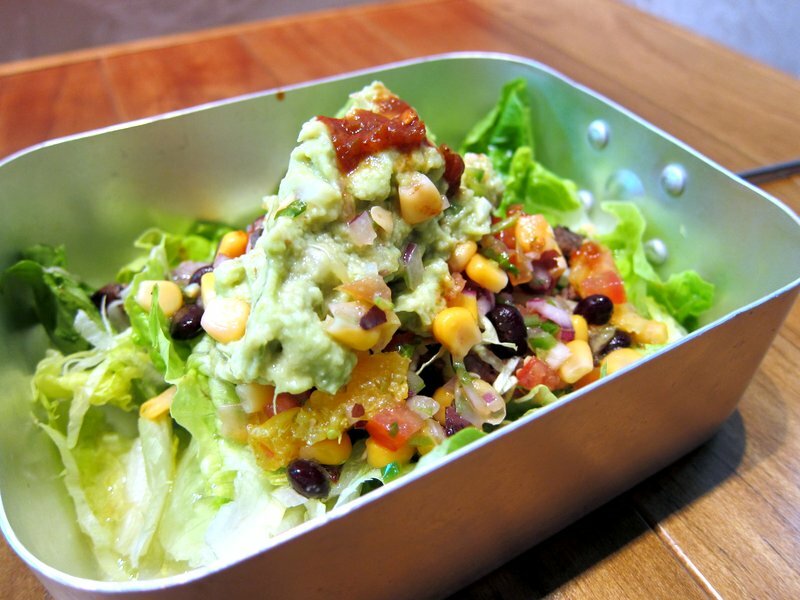 MexOut – Healthy and brisk Mexican food for the CBD! 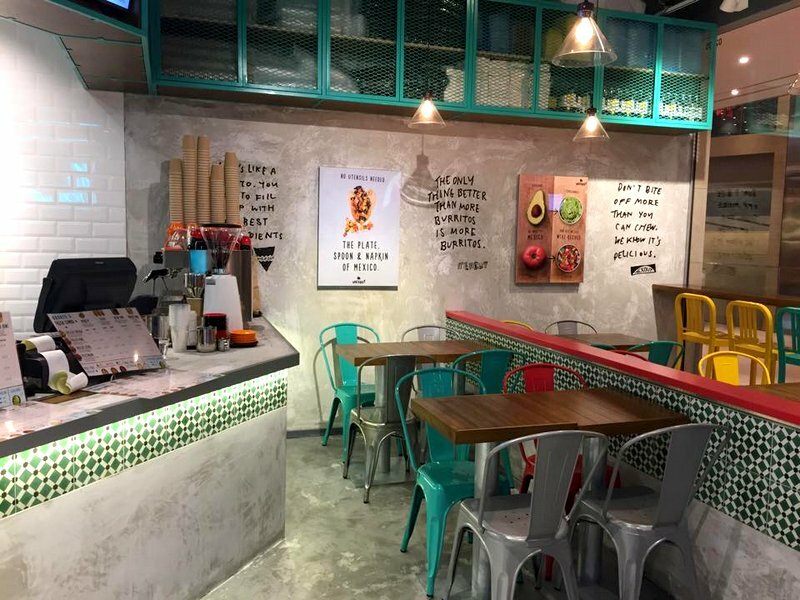 I reckon brisk, inexpensive eateries that serve healthy yet still delicious food is fast becoming the trademark of the food scene in the CBD area, judging from the recent spate of openings. And just alone in the huge tower 3 of MBSFC, a couple of such restaurants could already be easily spotted on the second floor, with MexOut being the newest tenant, that has just officially opened few days back. Widely known for their distinctive herbs and wide-ranging dips, MexOut has prepared a luscious range of Mexican dips for us, out of which the avocado-based guacamole is most commonly used as a complement in their dishes which should pander greatly to the health conscious. 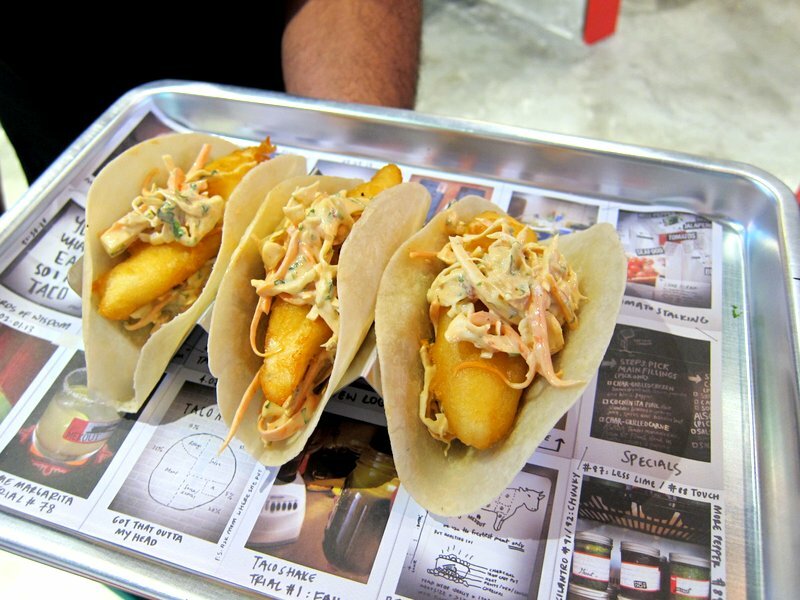 Starting off with the Fried fish taco, the creamy tasty chipotle slaw helped to lift the overall taste of the golden-battered snapper fillet into the heavier-tasting spectrum, making it a great comfort food. $6 for 1. 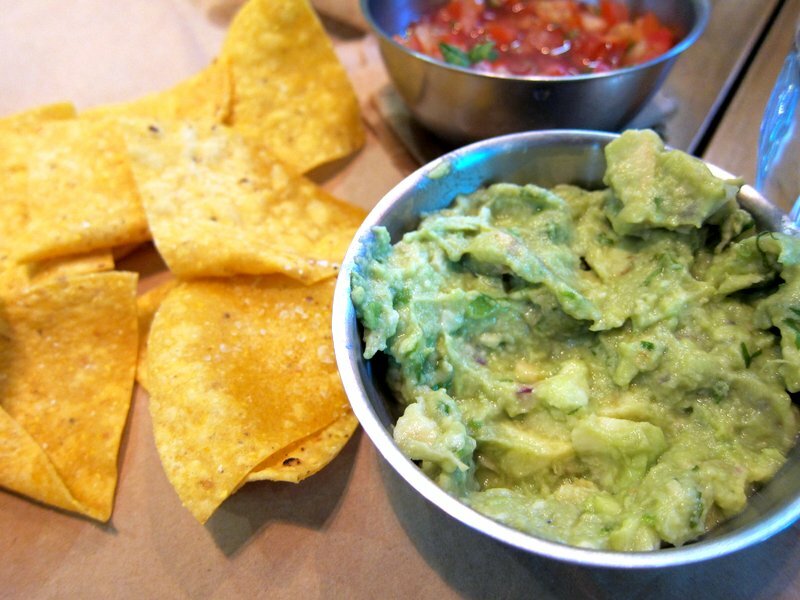 And this is when the Guacamole mania kicks off! Salad bowl with pulled pork topped with a spicy salsa picante. Not just simply braised and made savoury, orange juice was thoughtfully utilised in the process that gives a light refreshing citrusy cut to the heavier tasting pork. $11.90. 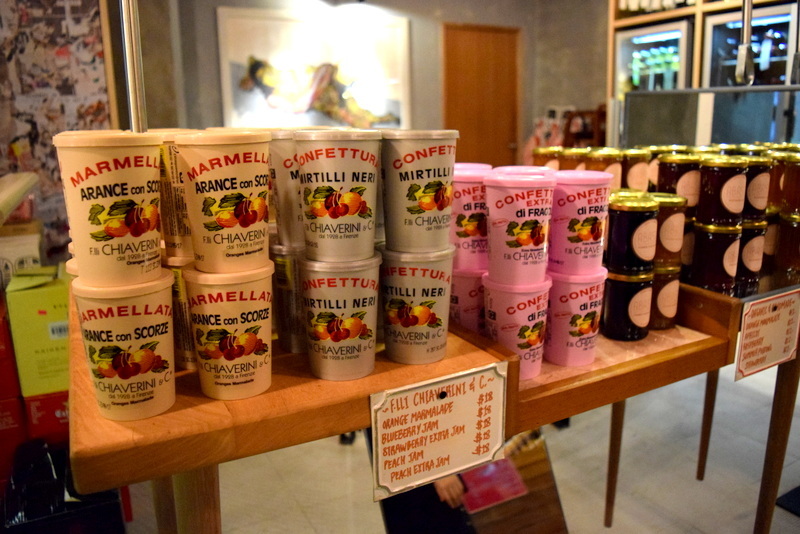 Another interesting observation should obviously be the way in which these foods are plated as these mass tins would definitely make a Sg male reminisce, the days when the forests are our homes. 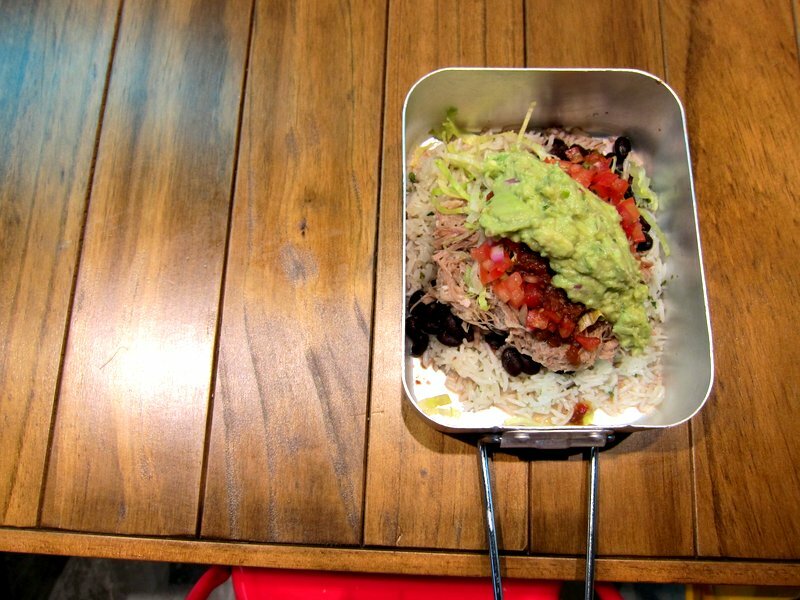 But the food in it is definitely much better, as the Burrito Bowl with pulled pork greatly satisfies the savoury stomach. 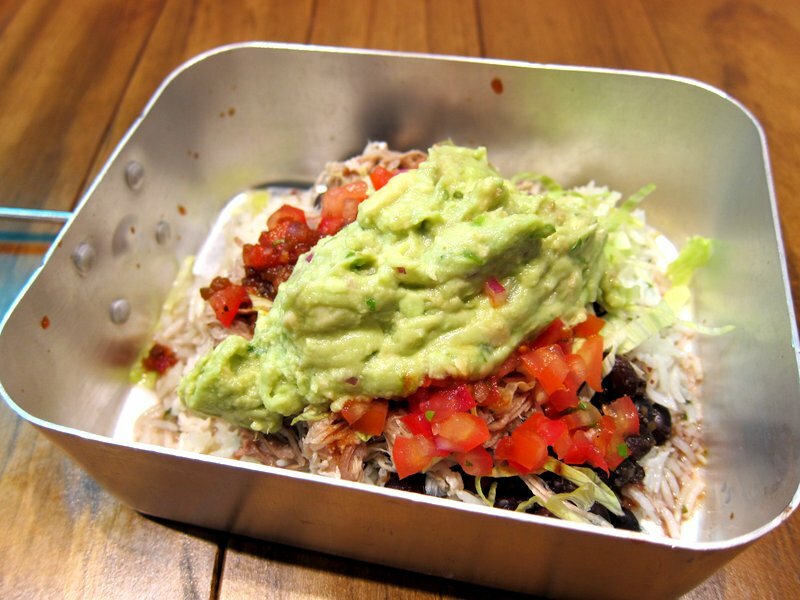 Topped with the heavy, zesty salsa, this burrito bowl is indeed a refreshing one. $11.90. 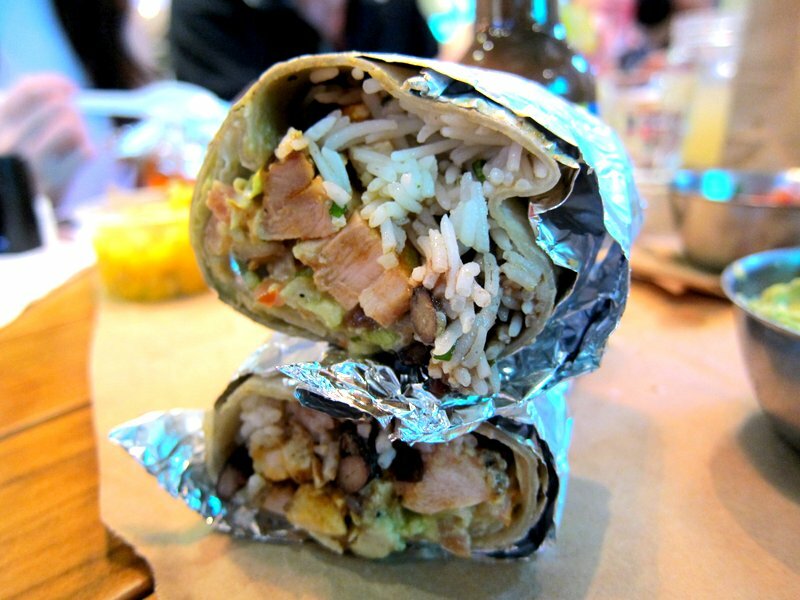 And if you are unsure of the best ingredients to be added to your burrito, then get the “most popular burrito” that has already been thoughtfully curated with the most representative Mexcian complements. $11.40 for a small. $13.90 for a large. 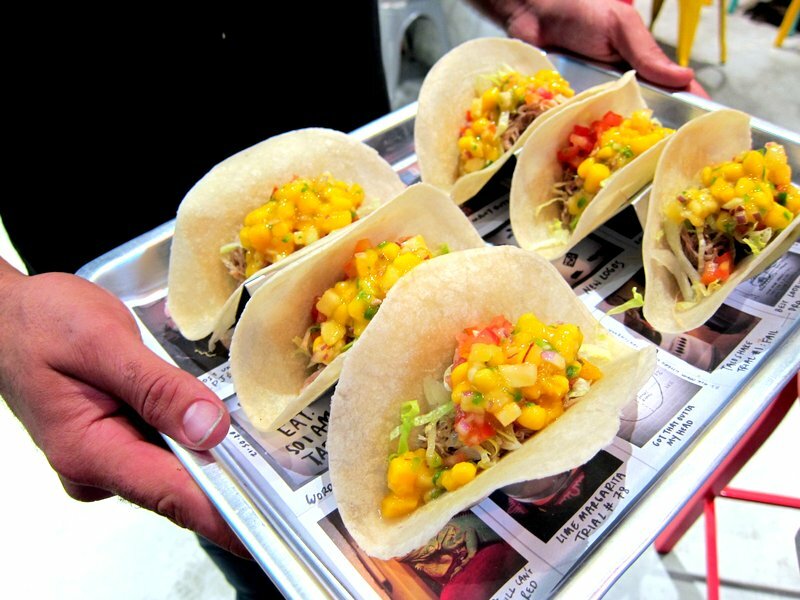 And this is an exemplary marriage between the sweet mango pineapple salsa and the savoury pulled pork. Incongruent ingredients they may seem intially but actually worked seamlessly as the sweeter mango enhances the flavour of the pork. $11.90 for 3 or $8.90 for 2. 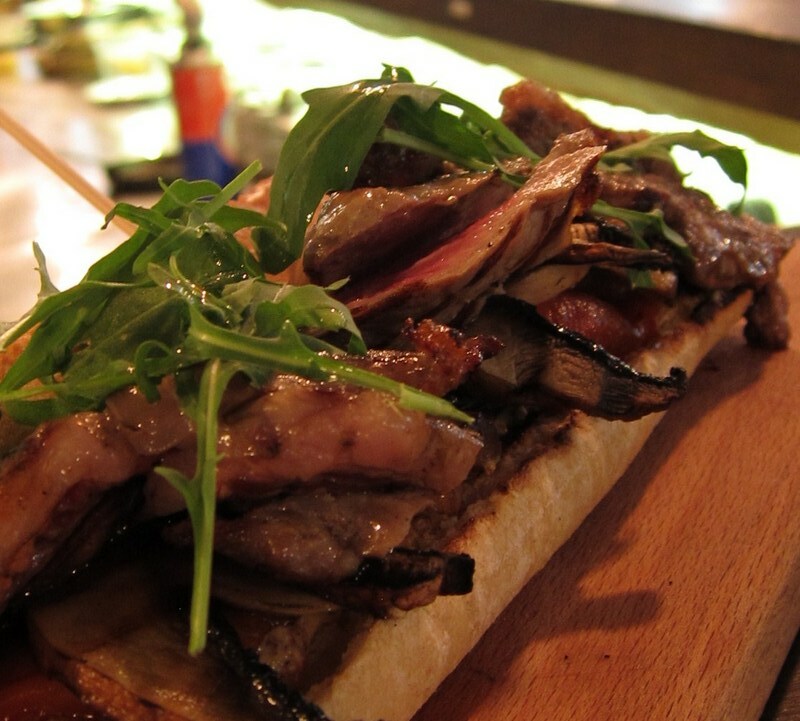 The most favourite dish of the day, unanimously went to the sliced steak & Chilli Jam! 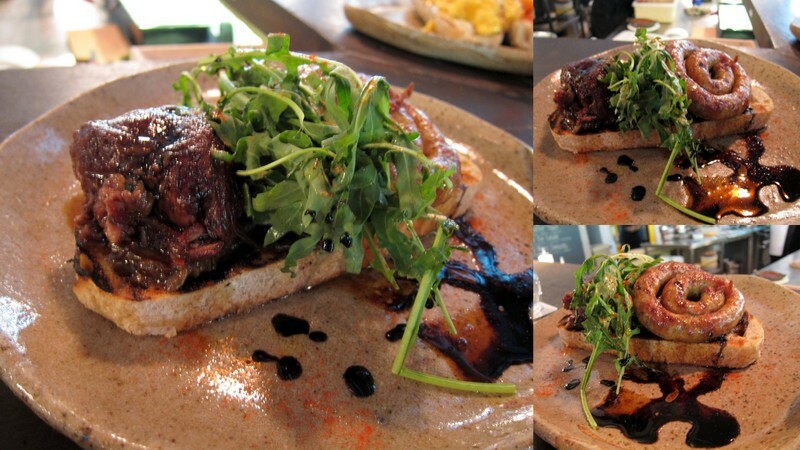 Beautifully infused with the distinctive herbal aroma, these tender NZ beef slices were beautifully roasted to render a pinkish hue within and the Chilli Jam topping gave the final kick this dish would have all required! $9. 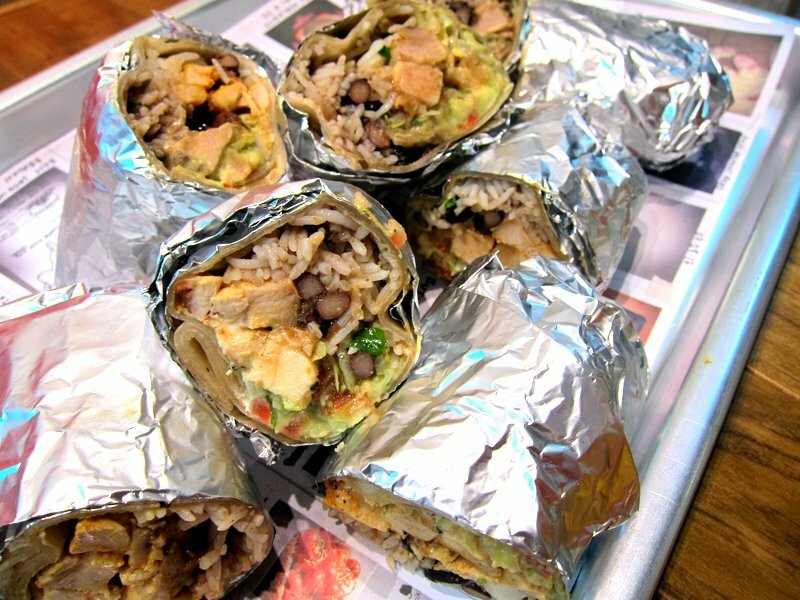 So wait no longer if you are still looking for a delicious Mexican hideout in town as MexOut has provided one of the most convenient and value-for-money options. And if you are too busy with the numbers on your office computer screen, MexOut does provide delivery service as well! Thanks to Marcus for the lovely invitation! After a recent facelift, Bochinche is even more determined to provide a more wholesome Argentinian experience. 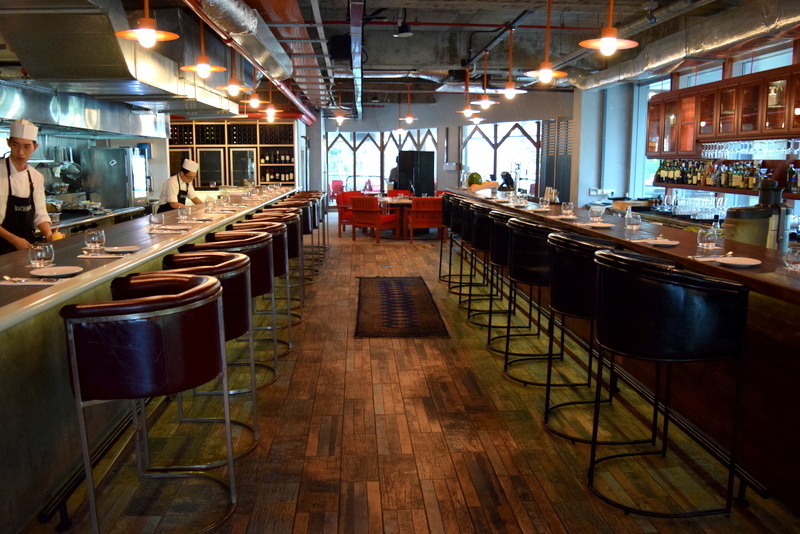 Apart from a revamped menu that now focuses more on the grill, Bochinche is also heavily stocked with Argentinian groceries such as Argentinian sweets, spices as well as different cuts of Argentinian beef. They are imports that I have not seen before and English is the fineprint and will definitely satisfy those who enjoy Chef Diego’s dishes. In addition to their focus on the beautifully grilled grass-fed beef (on alfalfa even), the new menu also includes a Cold Bar section which has a tantalising range of light and refreshing Argentinian starters to choose from. 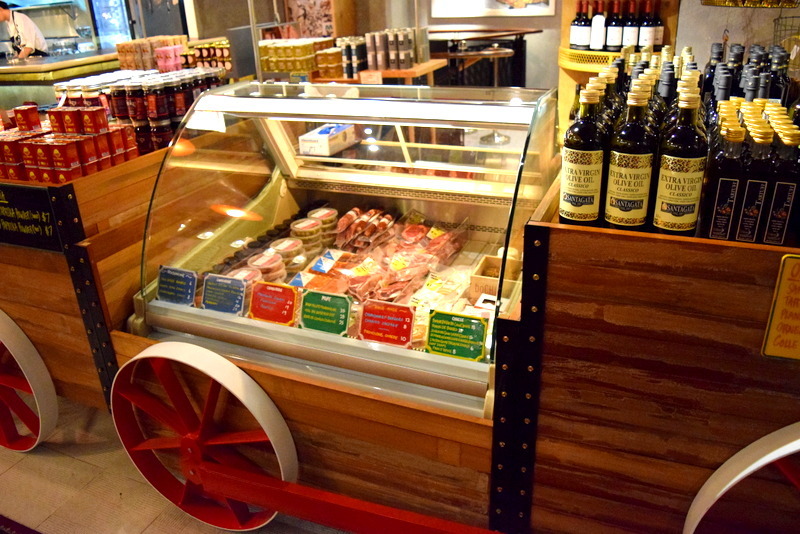 This indeed reflects Chef Diego’s sincerity and passion in bringing the best Argentinian produce to his customers. 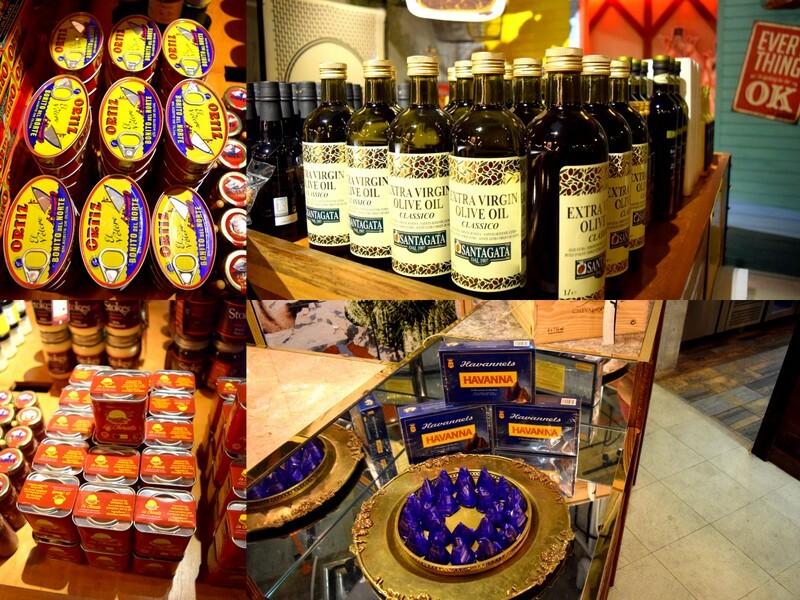 Taking a brisk walk through the groceries section, you could find virgin olive oil, canned tuna, Havanna chocolates etc. And if you crave for a good juicy beef burger or steak, you could also get your favourite grass-fed Argentinian beef in various cuts from the chiller section. It is just so convenient that you could purchase them from the restaurant itself. These jams caught my eyes as their packaging are definitely unique. While the transparent jars are the usual spread for the bread, the orange marmalade, blueberry and strawberry Jams packed in opaque containers are sweeter and more suitable for cakes. 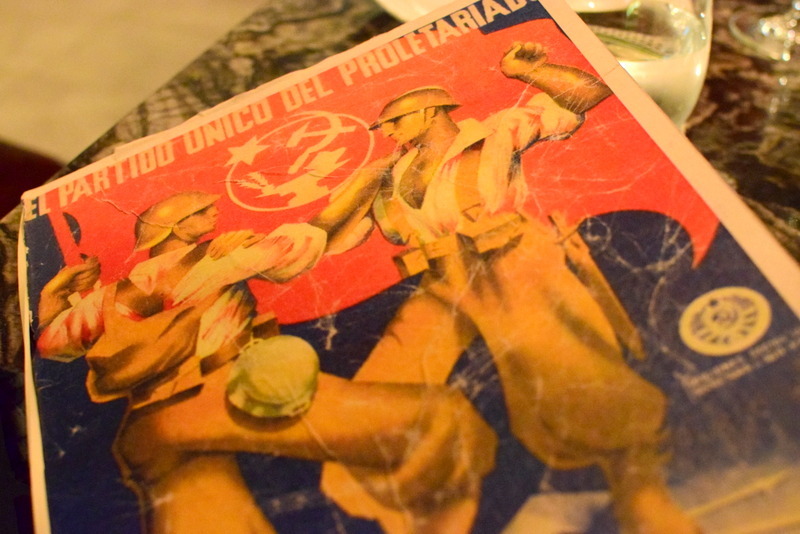 And instead of the usual clipboard, Bochinche’s menu has become funkier. 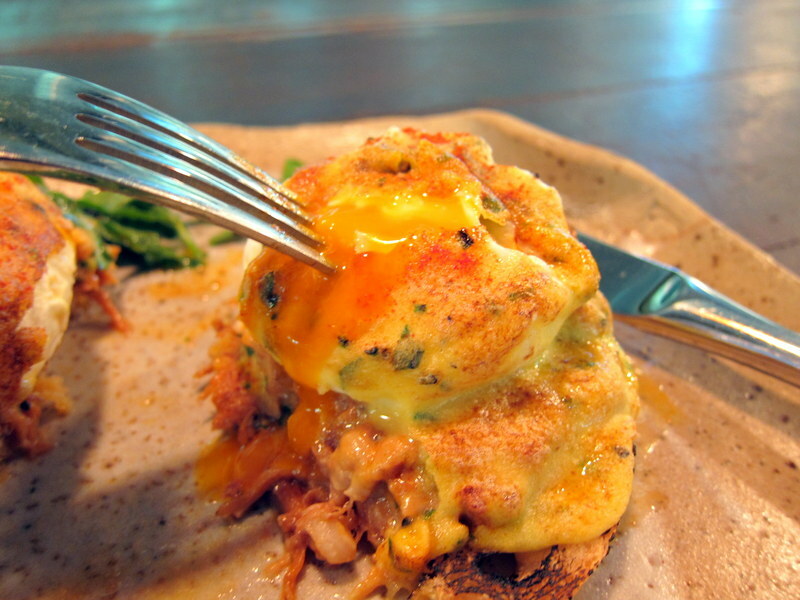 One of the highlights from the Cold Bar includes this plate of crab toasties. 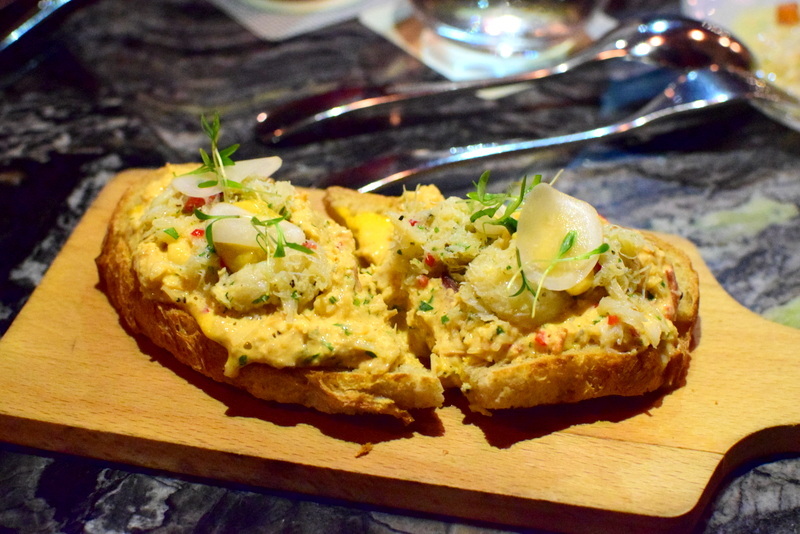 This was my favourite as the fluffy crusty toasties are topped with a substantial amount of refreshing crabmeat and together with the pickled turnips, humita and chopped coriander, this toast was perfect. $19. 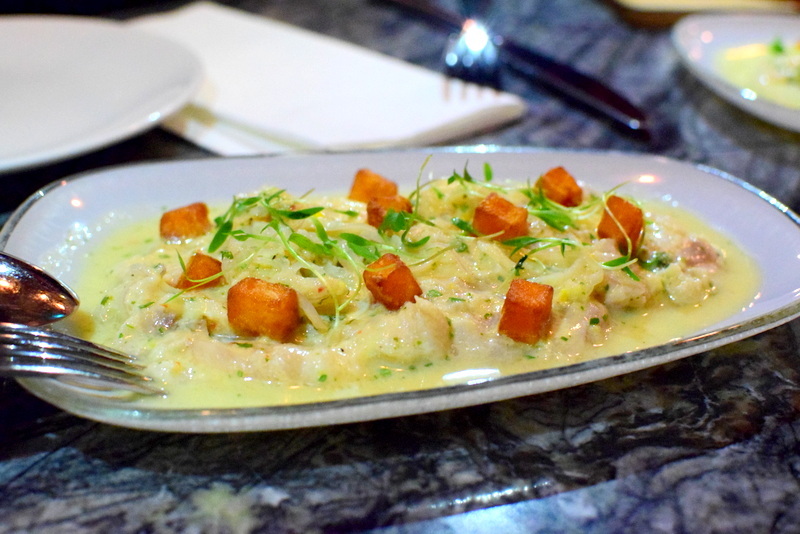 The other highlight from the Cold Bar – The fresh sea bream ceviche cured in tiger’s milk (citrus-based marinade) topped with sweet potato cubes is indeed another very invigorating starter as the citusy sour punch would definitely wake you up. $15. 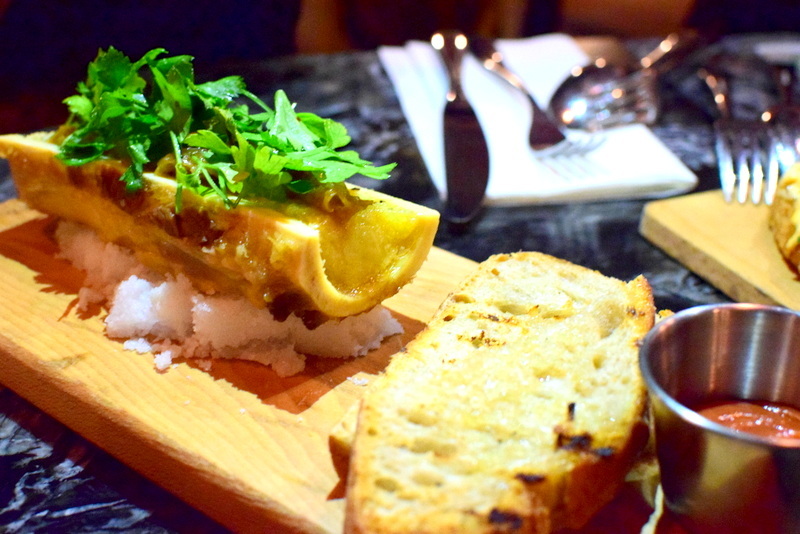 Moving on to the hot starters, we got the creamy buttery roasted bone marrow topped with well-glazed caramelised onions. 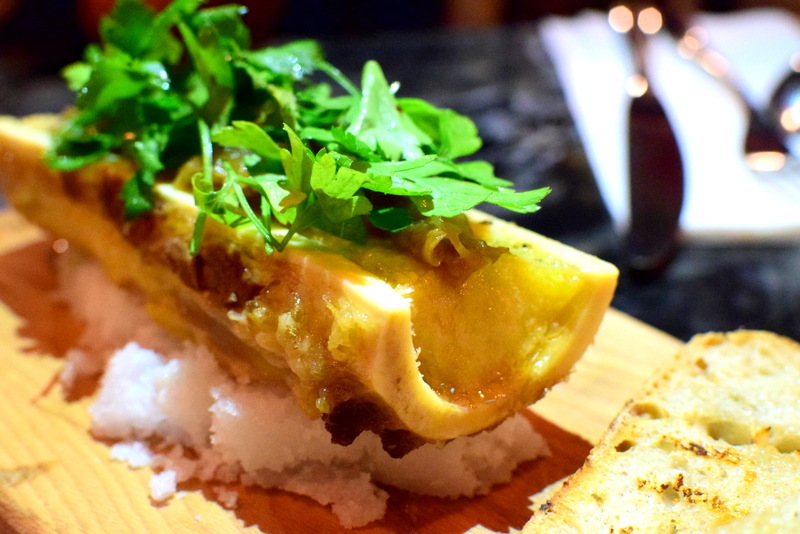 The parsley added to it gives the otherwise cloying but fragrant bone marrow a refreshing touch. This is my first time trying bone marrow and I have to say the ones over here are really well made, without any irony taste. However, as I will need to run around Mars if I were to down this, I only tried a little bit. I would say go for it if you are not held back by the fats! $13. 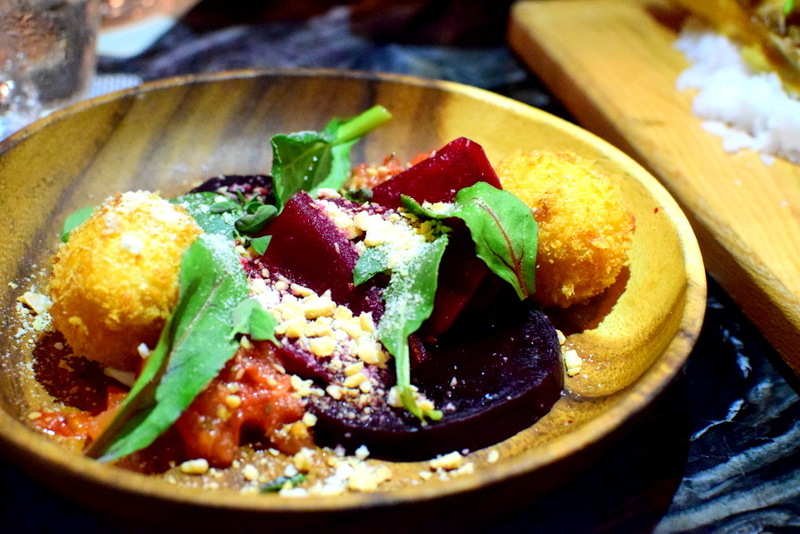 And the other hot starter was the beetroot and tomato salad with the fried goat’s cheese garrapinada for $15. The beetroot was the one that caught my tastebuds as the more lightly coloured one has a crunchy texture while the dark slices are really soft and moist. Didn’t know that the different parts of beetroot actually have different textures. 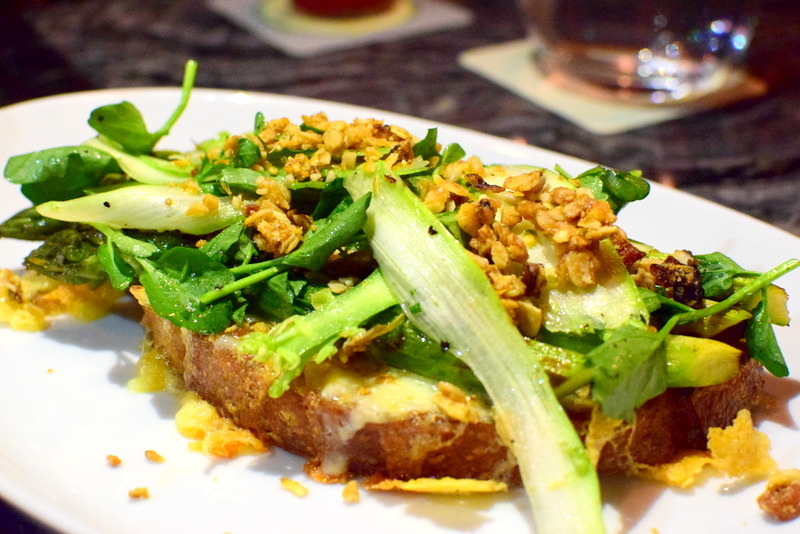 From the grill, we got the Baked asparagus with baked brie and grated granola. $19. Brie has always been my favourite cheese as it isn’t pungent and adds a creamy addictive texture to whatever you are having. This came as baked and melted and that was heavenly. The grated granola adds an additional crunch to the overall texture. 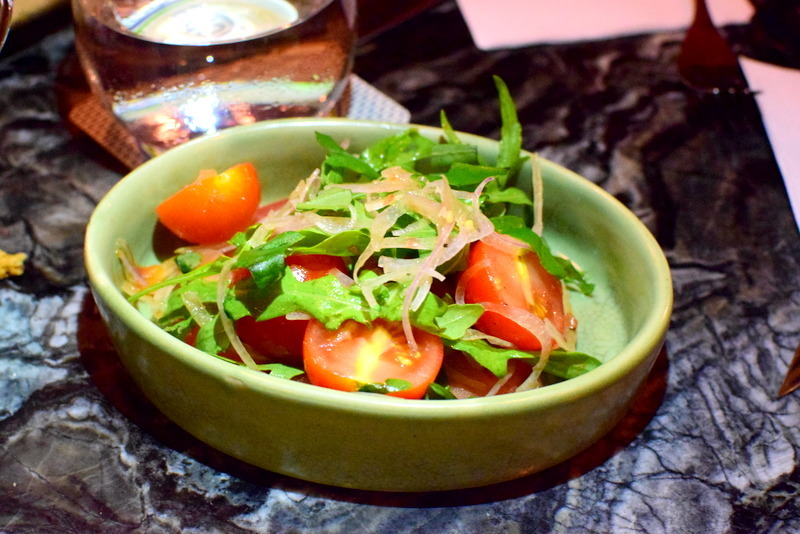 A really delicious Vegetarian dish that even I, a meat lover, would order! Rib eye steak 300g for $55. The beef that Bochinche serves, as aforementioned, is not only grass-fed but actually raised on high-quality alfalfa on free range. This makes the beef not only more flavourful, but is also regarded as healthier. 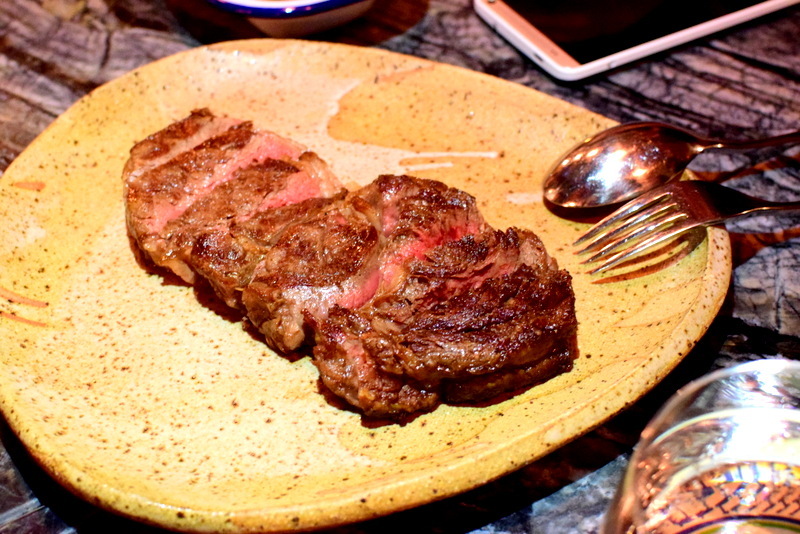 These are all evident from this slab of rib eye as it is simply tender, succulent, juicy and addictively fragrant. 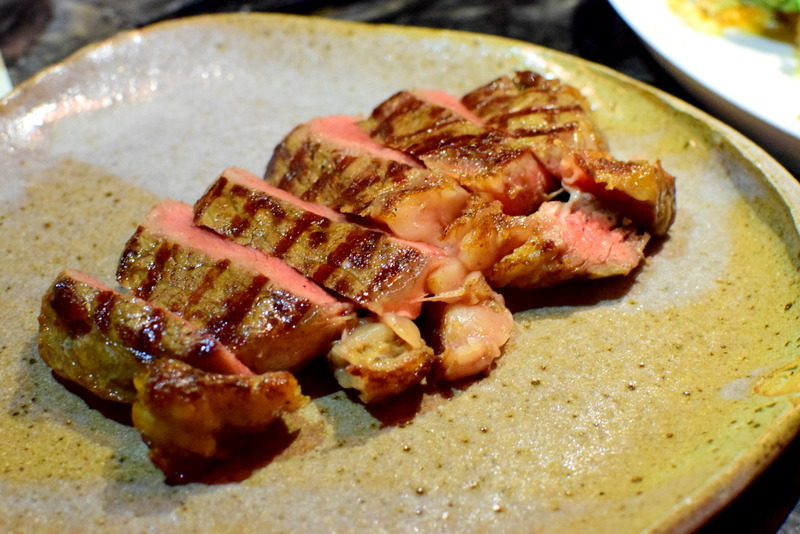 The alluring pinkish sirloin steak 300g is again another highlight in the grill section and after knowing how these Angus Steers are reared, you should have confidence in the quality of beef provided over here. $49. Another dish from the grill that caught our eyes was the Lamb chops served with anchovies salsa verde and chopped mint. Lamb was very tender and yes I skipped the big slaps of fats underneath the chunky lean meat. 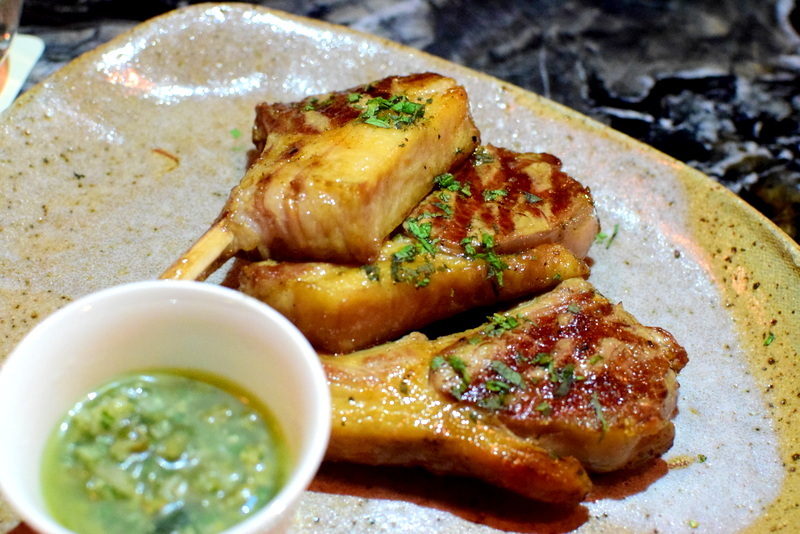 Love the salsa verde that comes with it as it gives the chops a refreshing edge. $45. Some sides to go with your mains? You could get the tomato and chopped basil for $10. 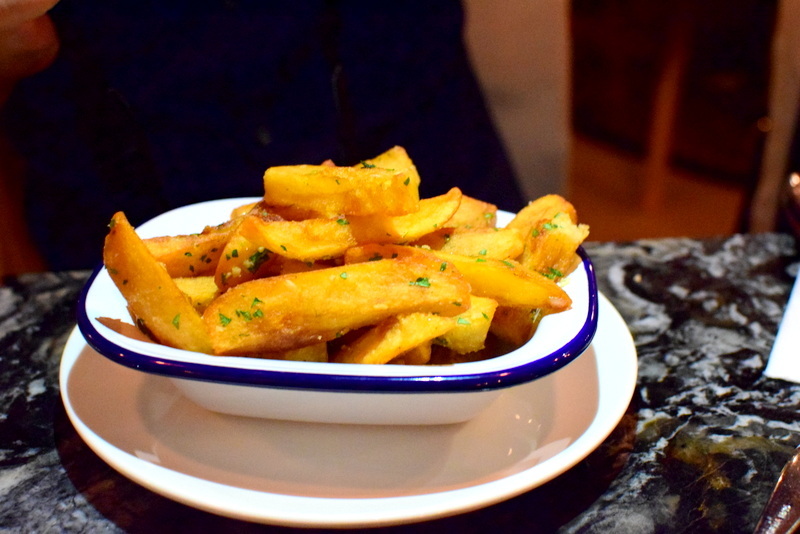 Or the award-winning chips for $10 which are fragrantly coated with garlic butter. Very addictive indeed. And after such a big meal, it is always good to end off with Bochinche’s classic desserts. The thick, sinful chocholate pudding with salted caramel, berries and brioche croutons didn’t feel overly cloying and instead I could finish this whole cup on my own. Just think chocolate and salted caramel and your choice for desserts would be pretty straightforward. $16. 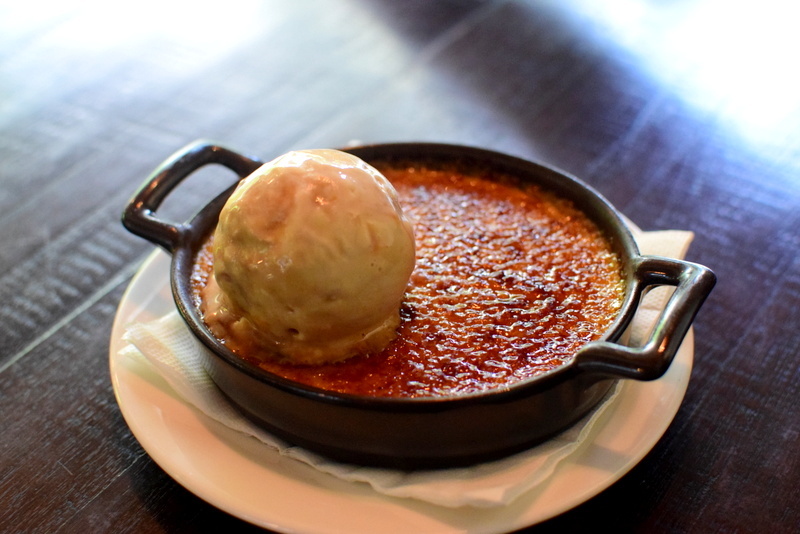 The ‘Dulce de leche’ creme brulee & banana split ice cream is another hit as the super thick, creamy creme brulee glazed with a beautifully and thinly caramelised top just wouldn’t allow you to stop. $17. And our final dessert, the creme caramel, ‘dulce de leche’ (at the side) & chocolate crumble was the third hit for me. Indeed, all the desserts we tasted that night were all hits without any misses. I guess that’s due to my soft spot for the sweet, thick, creamy dulce de leche. And so here am I again, impressed by Bochinche for the 4th time. Bochinche’s new relaxed menu, filled with its refreshing cold bar, classic hot starters and a strong grill that also includes fish and free range chicken, is indeed set to give her customers a more wholesome and exciting Argentinian experience, not forgetting the unique Grocer Market that customers can purchase their favourite Argentinian groceries from. Still wondering what is Argentinian food? Then wait no longer and come down to experience it for yourself! Also would like to thank Alexandra and Janet for bringing us through such a wonderful Argentinian course. 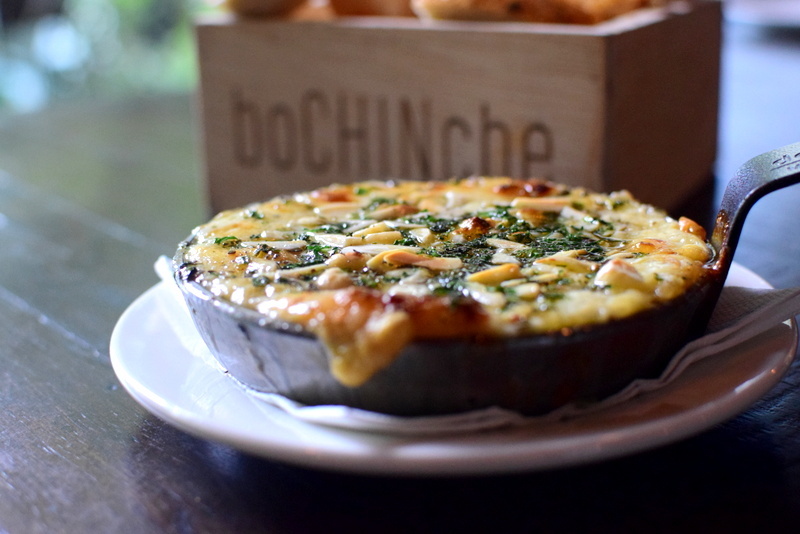 Bochinche – 3rd time here and still loving it! 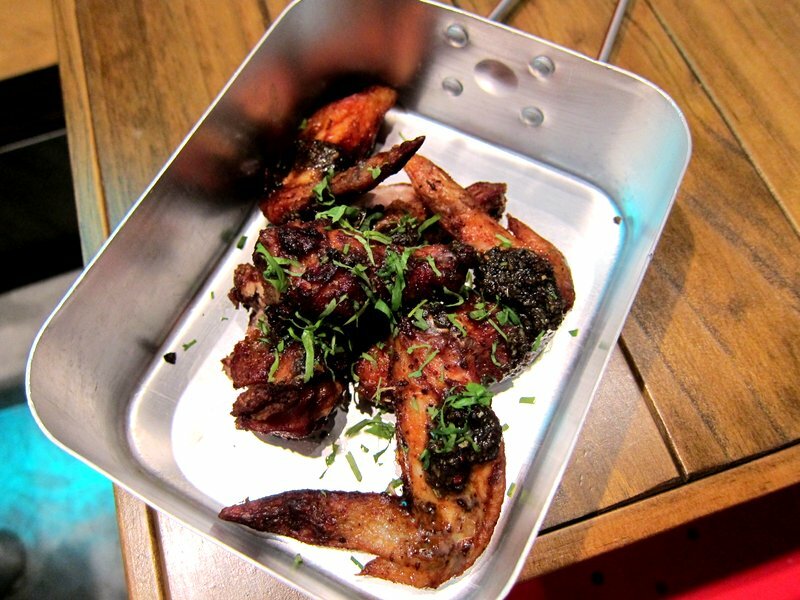 Bored of the usual run-of-the-mill brunches in sg? Envious of the people in Australia who get to taste quality cafes? 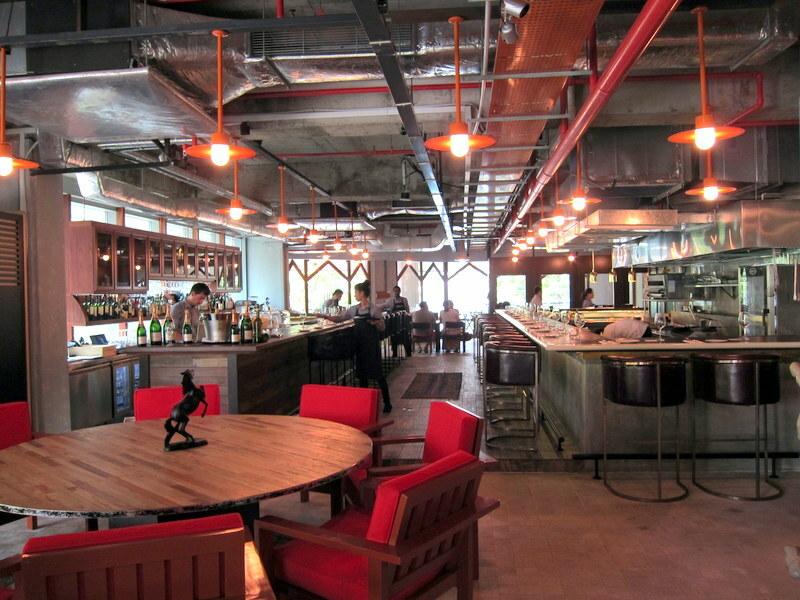 Then, come down to Bochinche to satisfy your craving for an excellent brunch! Indeed, it is my third time here and many thanks to Alexandra and Janet for this invitation and their great hospitality. So the great chef behind Bochinche is Diego Jacquet who is based in London. He has two other restaurants, namely Casa Malevo and and Zoilo in the Hyde Park and Marylebone area (places I usually frequent during the undergrad days), of which Zoilo has a pretty similar menu to that of Bochinche. Alright, enough of history lessons and lets look at the gorgeous food. 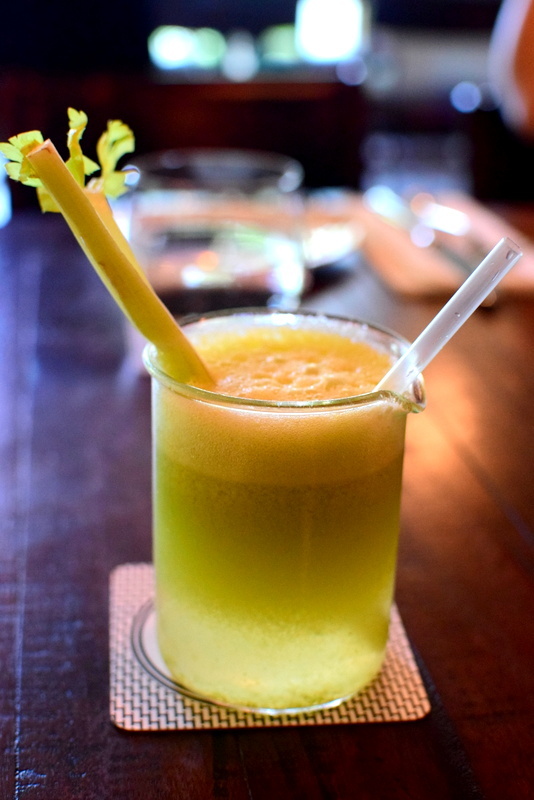 Pear apple and Celery juice that comes in a beaker. Refreshing and slightly sweet, this helps you to get ready for a hearty brunch. $9. Stretchy, warm melted Provoleta topped with almonds & sweet honey. This is again my favourite as I love the chewy texture of the fragrant cheese, with the honey giving it an addictive sweetness. $17. 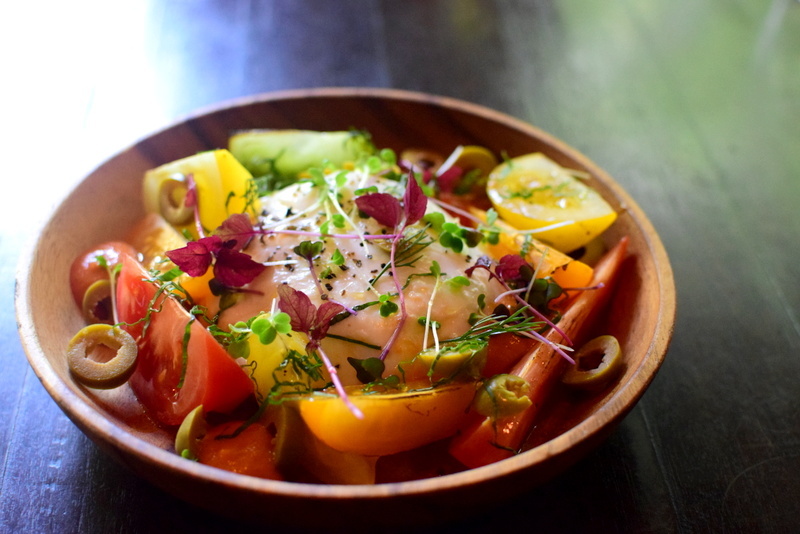 Vibrant tomato salad with burrata cheese, citrus olives & chopped basil. Three types of differently coloured tomatoes (red, yellow and green) are used here which is really quite impressive as they even pay attention to their colours. Burrata cheese is lighter than provoleta, so if you are not a cheese fanatic, this might suit you better. Janet was telling me that under the thick gelatin-like layer of the burrata, more cheese is pumped into it. Very interesting way of making this dish I thought. Love this salad as it is light and refreshing! $23. 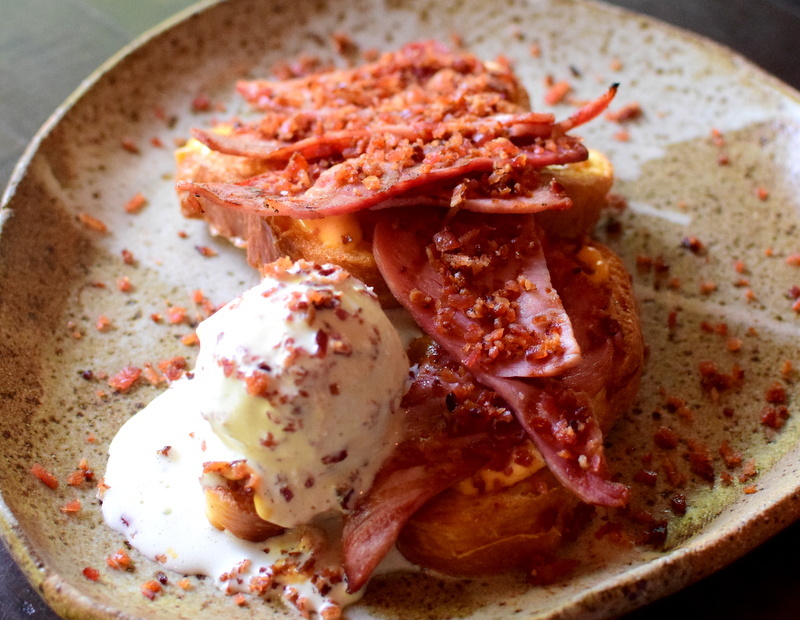 Brioche french toast topped with ham & bacon ice cream. Everything complemented each other, from the savoury bacon bits to the creamy ice cream and the fluffy fragrant brioche. And yes, that’s right it’s not your usual sweet ice cream but bacon ice cream with bacon bits in it. Did it work? Yes, it definitely did! At least for me. Daring and creativity clearly displayed in this dish without losing its taste! $19. Ricotta pancakes, berries salad, maple syrup & cinnamon crème fraîche for $18. Vibrant, sweet berries used here and when eaten together with the fluffy pancakes, this tasted perfect. It’s slightly similar to a light berry cheesecake that is refreshing and definitely satisfying at the same time. 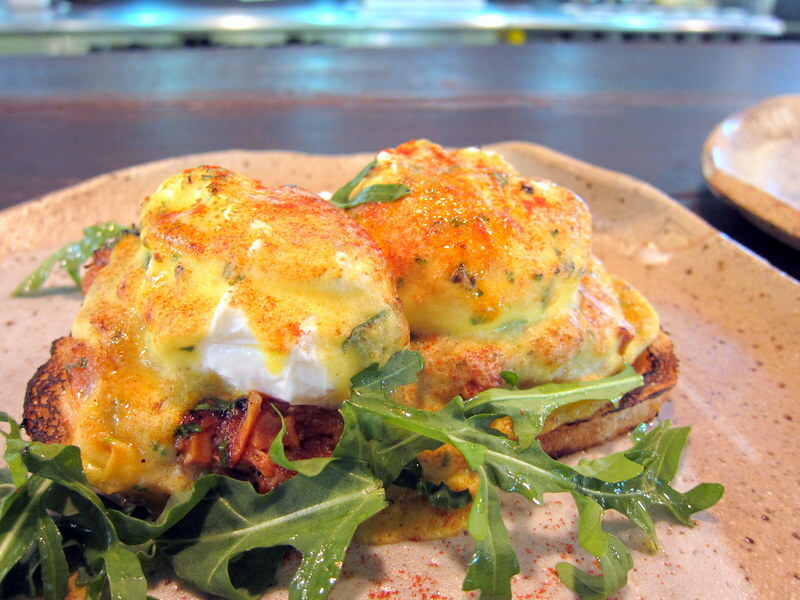 How can we ever miss the infamous egg benedicts in a brunch session? Super runny organic poached eggs on toast topped with thick, creamy hollandaise sauce and what sets this widely apart from most cafes is that soft, melt-in-your-mouth braised ossobuco (veal meat) is slotted between the poached eggs and toast to give it a fuller and more satisfying munch. $25. Delicious! 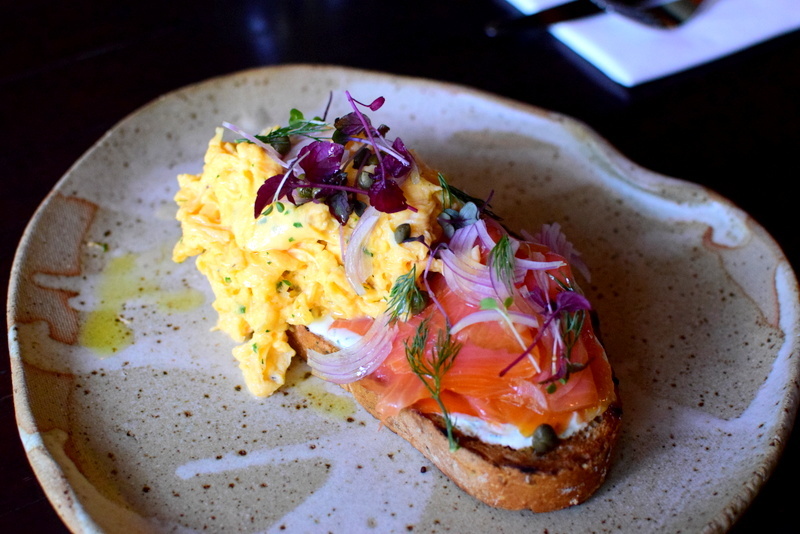 Smoked salmon & scrambled eggs with red onions, capers & dill cream cheese. Scrambled eggs were really smooth and soothing while the smoked salmon tasted fresh with the cream cheese and refreshing dill complementing its creamy texture and taste. I am usually afraid to take smoked salmon as it smells stale to me but it’s only Bochinche that I would not mind ordering this everytime I’m here. $24. 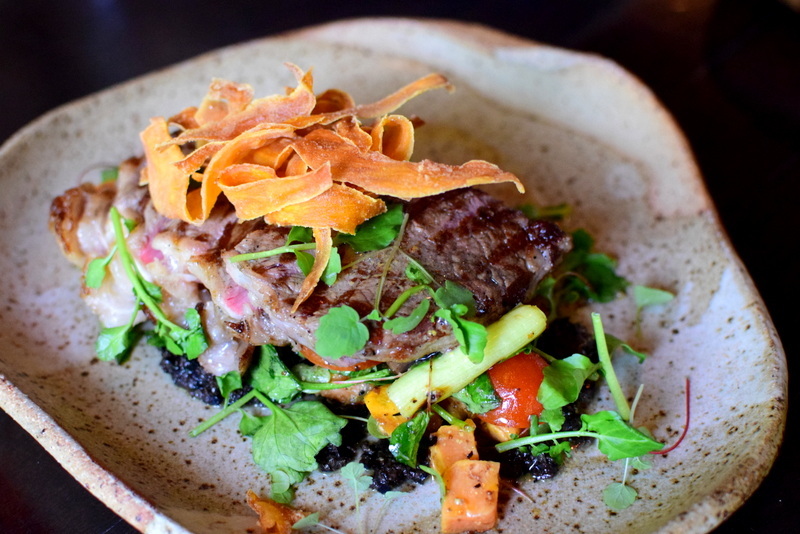 Sirloin steak salad with portobello, sweet potato, grilled leeks & mustard dressing for $29. A really generous slab of steak served here and there’s still a pink hue to it. Soft and not overcooked, this complemented the really interesting salad. I was particularly interested in the sweet potatoes which are the orange cubes and thin slices you see in the pictures and I believe they are prepared differently. One ingredient, two ways of slicing, two different textures attained, brilliant! 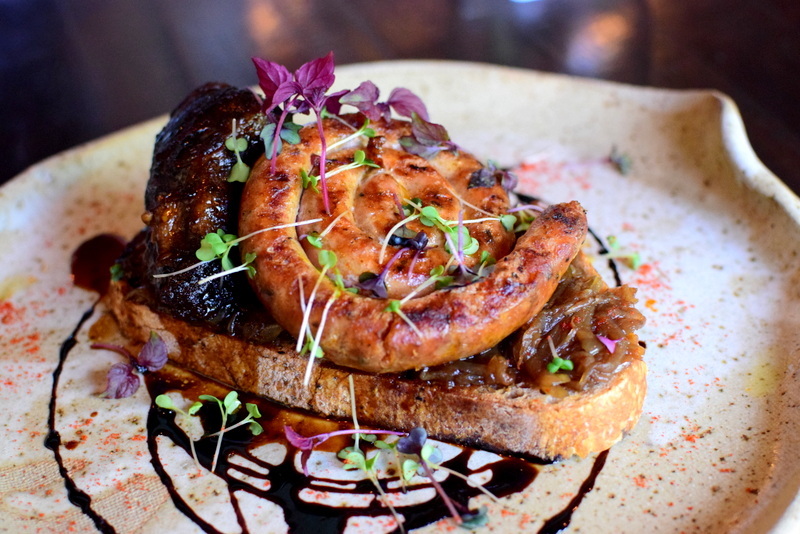 House chorizo sausage, Malbec braised ox cheeks & caramelised onions for $25. This has been and is still one of my favourites. 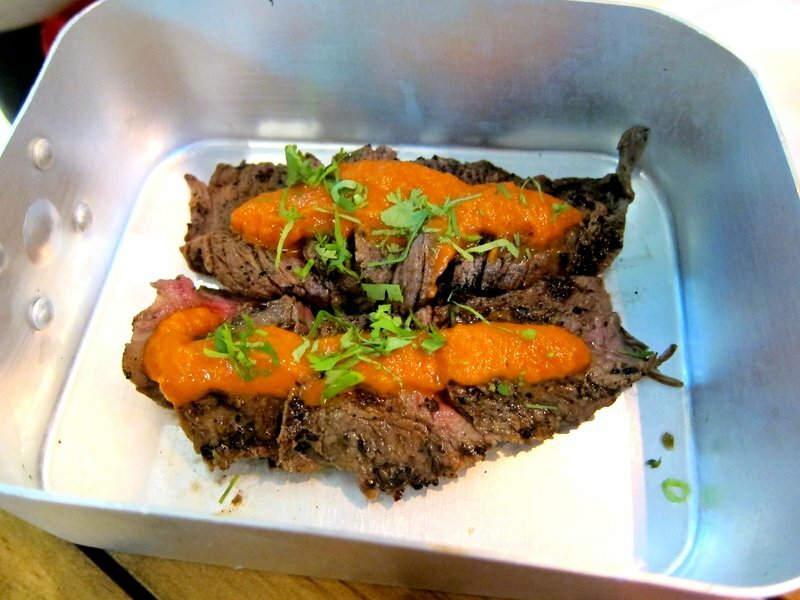 Ox cheek has a really soft texture and instantly melts in your mouth while churiso is intensely flavoured. Sweet caramelised onions complements the taste while sauce here also gives it an umami kick. 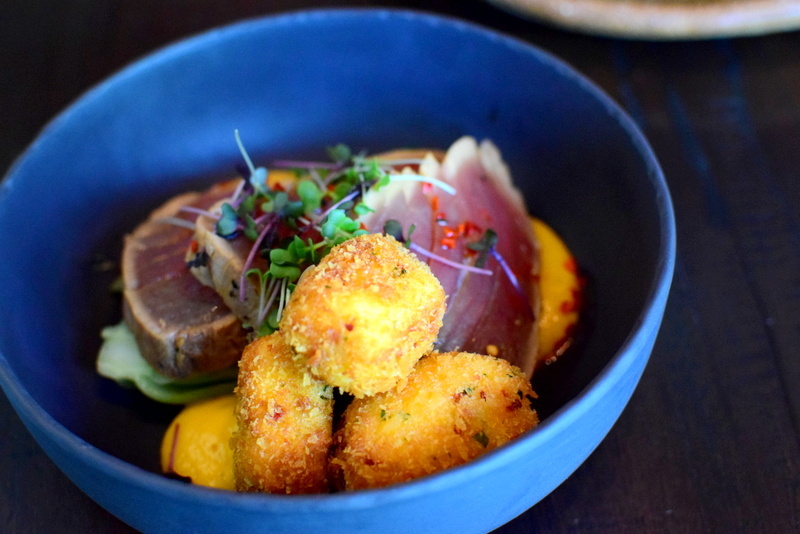 Need something that has a more Asian touch, then go for this yellow fin with crispy aji molido tofu for $30. As the name suggests, tofu is slightly spicy and is super crispy while the inside is silky and smooth. There is grilled pak choi underneath while the yellow fin tuna is cooked on the outside but raw inside. Really fresh and the whole combination was delicious. Hohoho, here comes my killer dish. 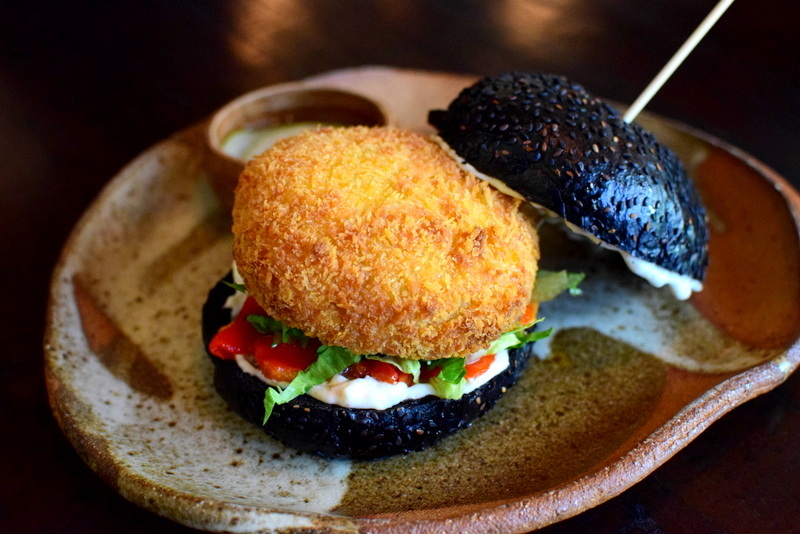 Squid-ink burger, smoked pepper, chopped romaine, crayfish & dill mayo. I thought it was charcoal bun initially but it’s actually infused with super black squid ink. The crust of the bun is crispy on the outside and fluffy inside which makes it very delicious. I love how chunky that crayfish patty look, so luscious and inviting isn’t it. Just like how it looks, the patty tasted really succulent and juicy. $27. And we come to the desserts. 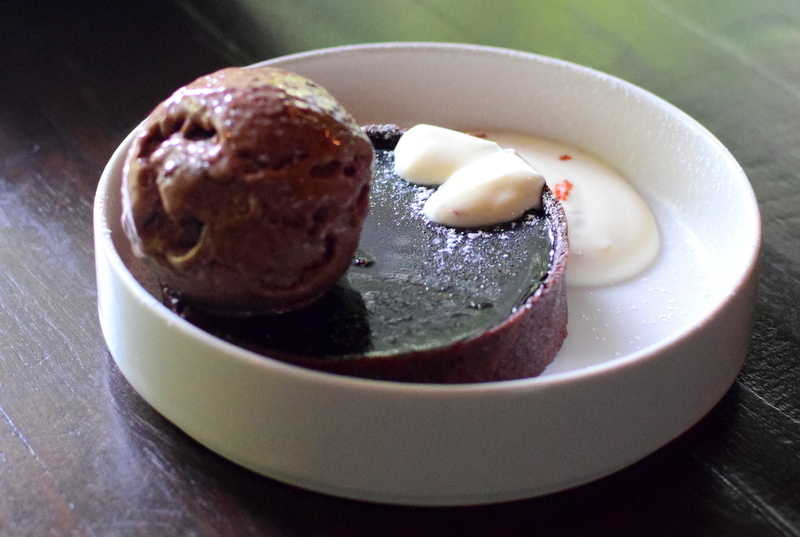 Bitter chocolate tart, chilli flakes yogurt & chocolate ice cream for $16. Yes the chocolate tart tasted bitter and I like that as it feels healthier. Also love the clever use of chilli flakes to make the taste more exciting. “Dulce de leche” (literally candy made from milk) crème brûlée & banana split ice cream for $17. 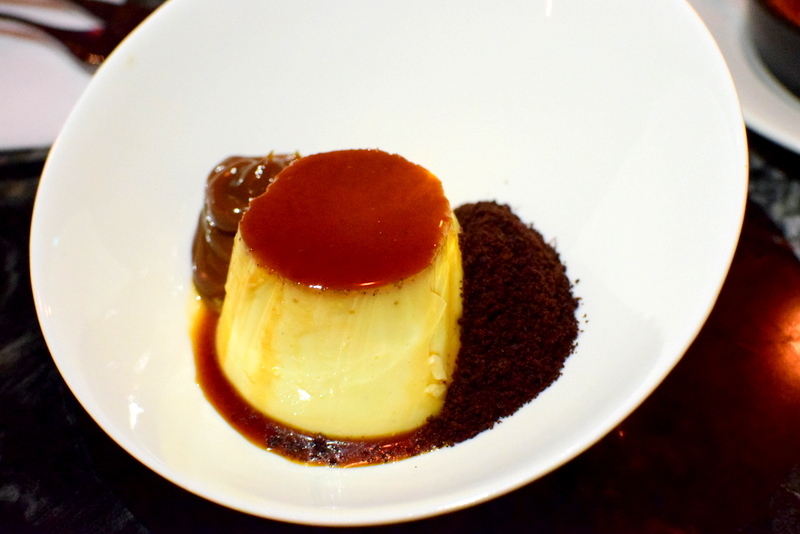 Really well cameralised top layer that is so brittle to the slightest touch and underneath it is the delicious dulce de leche infused custard which tasted so thick, creamy and definitely addictive. I made sure my spoon was clean after finishing this. Yummy! 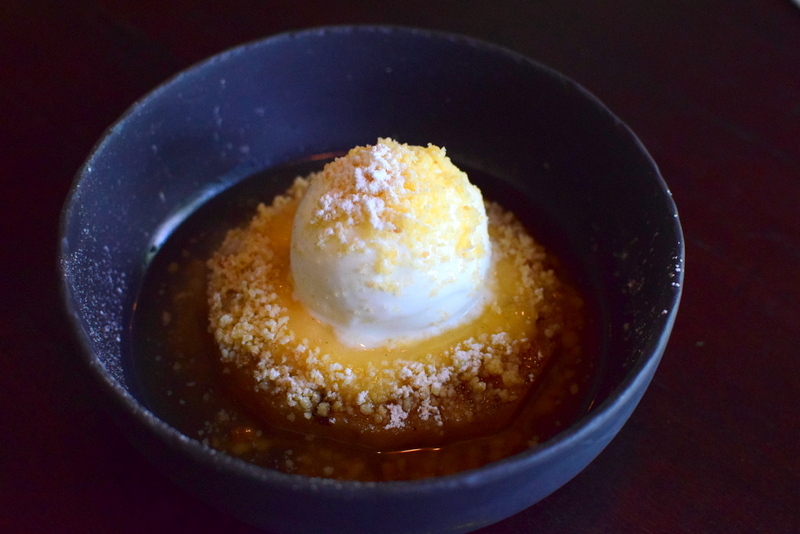 Grilled pineapple, mate tea granita & “arroz con leche” sorbet, lemon crumble for $18. A more refreshing and lighter dessert this is, the pineapple is soft while the creamy sorbet complements its taste. 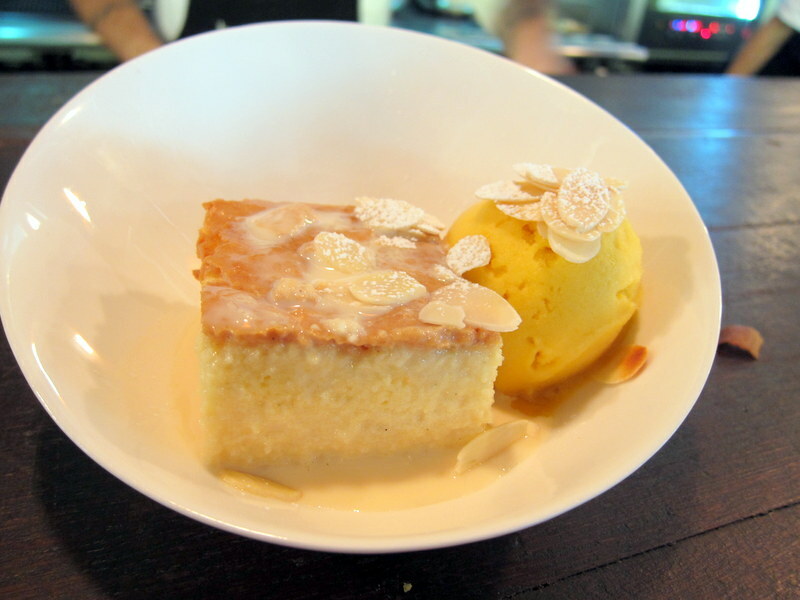 And lastly, this is my favourite dessert – Milk cake, passion fruit sorbet & toasted almonds. $14. Milk cake is really fluffy, soft and fragrant while the almonds gives it an extra crunch! Passion fruit sorbet was also intensely flavoured, thick and refreshing. 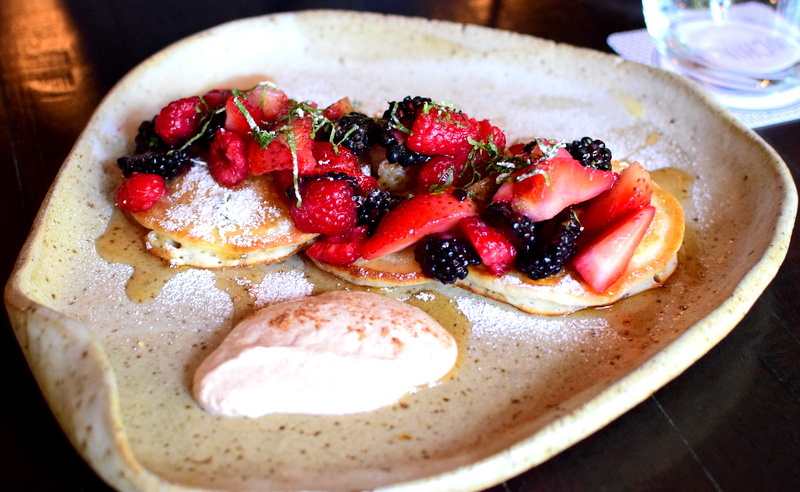 To sum up in three simple words, Bochinche’s brunch is daring, creative and spot on! This is why I always highly recommend Bochinche for brunch if you really want to experience a true good one. The restaurant is also spacious and so you don’t have to worry about encroaching into other people’s personal space while dining which makes your dining experience even more enjoyable. If it is your first time there, you may have difficulty finding it. It sits directly above Common Man Coffee Roasters (which always have a never ending queue). Just get round Common Man, enter a building via a sliding glass door and take the lift up to Bochinche. Once again, would like to thank Alexandra and Janet for this really enriching invitation! Yes, I had brunch AGAIN and this is my second visit to Bochinche just after one week! My first eyeopening experience could be viewed here. It’s really a rarity that I chose to have brunch in two consecutive weeks and that really shows how good it is. And also I didn’t mind going back again as there are other things on the menu that I want to try but didn’t got to the other time. So I brought V here as she loves brunch and before she goes back to HK for a short break. Lets see what did I order this time. 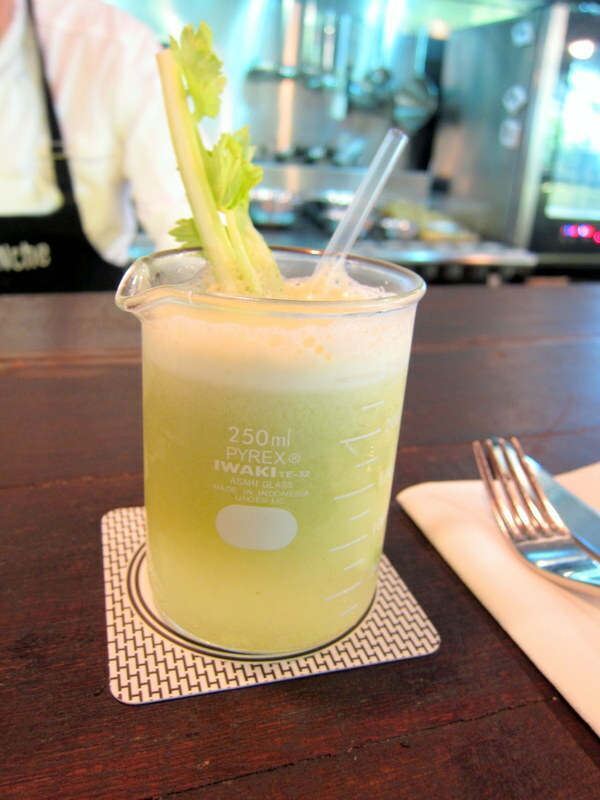 Got a glass of celery and fruit juice and it was pretty cute as it’s contained in a beaker. It’s taste? Good and refreshing but I think this can be easily replicated and you can just make this at home; as good and much more. $9. Yeah got the ox cheeks with churizo again as V wanna eat it. As delicious as ox cheek is really tender and sauce was thick and fragrant. Churizo wasn’t overly salty too. About $25. I never like to order egg benedict in cafes as I think that they always taste very normal and maybe monotonous, especially when eaten together with ham and bacon. But this was so good! The poached eggs were definitely runny, didn’t expect anything short of that. But I didn’t expect it to be slightly spicy, and instead of boring ham and bacon, fresh meat shreds were placed at the bottom with really savoury sauce that goes so well with the yolk. Ok, this, I think is the best poached egg meal that I’ve ever had and wouldn’t mind having again. Really delish! About $25. Cinnamon bun? No, it actually is ham and cheese and costs $9. It looks so inviting on the tray but I started to regret after knowing that it is ham and cheese as I thought that is really a common and normal combination. But I felt so lucky that I ordered it after all as I would regret even more if I didn’t. It was soooo good! Even though V didn’t want to eat it, she couldn’t stop after having one bite. The winner bit lies in the pastry really. Very fragrant definitely and super soft, and slightly airy. It has this peculiar texture as it is not just one big bun but made up of many different layers. That is what makes it so unique and super fluffy. Super fragrant with an awesome texture, the savoury ham and cheese are scattered between the layers and it was just very delicious. 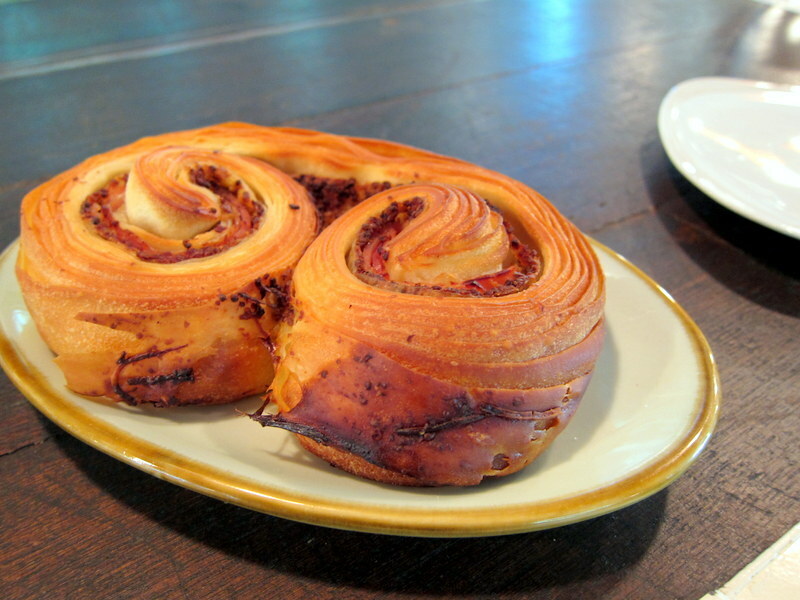 I got quite hyped up by this seemingly boring pastry actually. Yummy! And then it’s time for desserts. 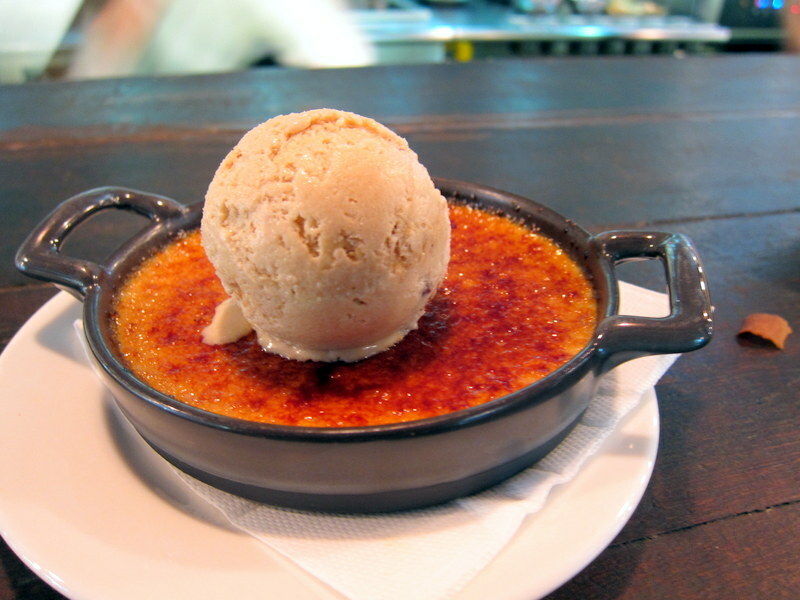 So got the creme brulee with banana ice cream. 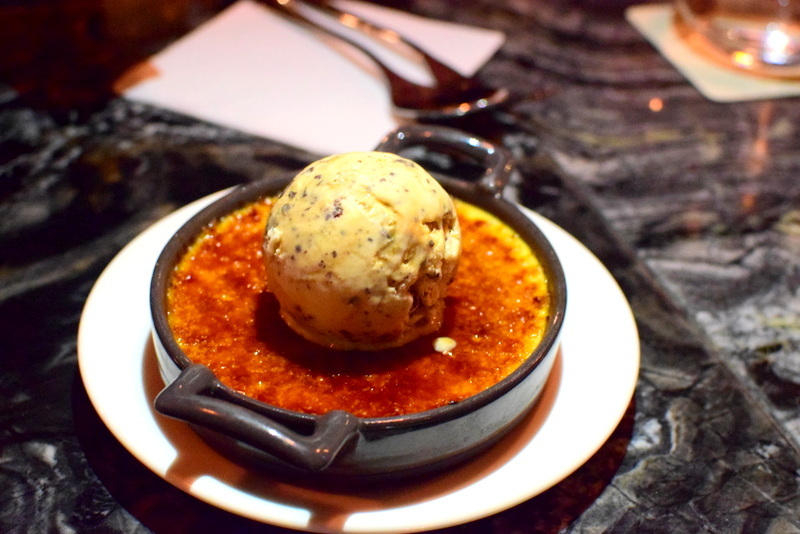 Very soft and creamy creme brulee and the torched caramel on top was thin, crispy and not overly sweet. 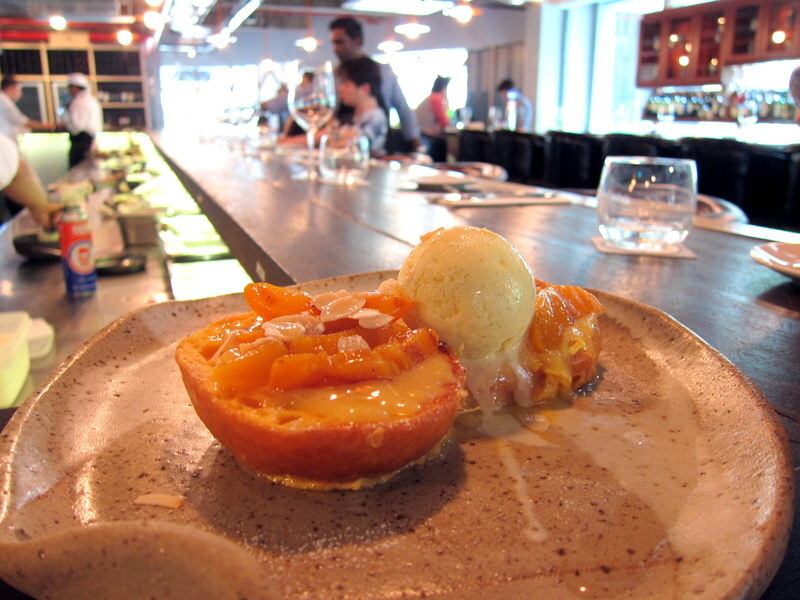 The banana ice cream too is thick and fragrant and goes well with the creme brulee beneath it. $17. Got the milk cake with passion fruit sorbet. Milk cake was really delicious, quite dense yet still soft and the almonds go very well with it. The milky sauce makes the cake slightly creamier and tasty. The passion fruit sorbet was slightly sweet and actually very sour that makes it really refreshing. $14. Bochinche definitely impressed me but did it impress my brunch lover friend V? It is an unequivocal yes! Best brunch ever again and I think Bochinche brunch hasn’t disappointed any of my friends before. It seems to me that the whole menu is perfect actually as I haven’t gotten something I didn’t much like over these two weeks. So each of us spent about $58 and yes, it isn’t exactly cheap but we felt that it’s really worth it. And she would recommend ppl to go here in future. Great Sunday brunch! Yes, I had brunch! I am not a brunch lover, in fact, I dislike brunch as it doesn’t feel like ‘real’ food to me. Usually, when brunch is suggested or mentioned by friends, the first few things that come to my mind will be egg benedict, English full breakfast, some open sandwich with bacon bla bla and these are really boring food to me as it doesn’t take a great chef to make and they literally feel like A+B=C! Despite a sudden increase in the number of cafes in Singapore due to the sudden interest in cafe food, these cafes usually either do not make the cut or are just above average. Thus, brunch is usually the last of the food list for me. 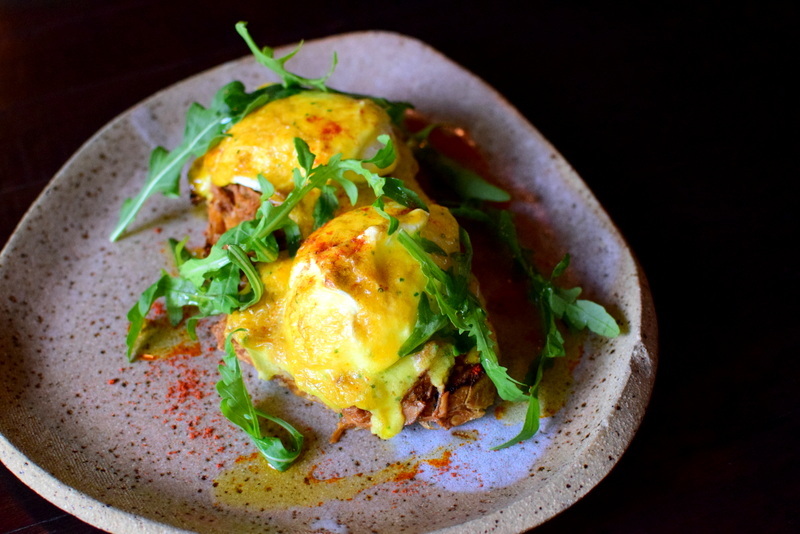 BUT, not anymore, after I have been to Bochinche, as this restaurant has a whole new take on brunch and gives a really refreshing perspective to it. I guess that’s because everything used here is really fresh. This place serves Argentinian food, and I don’t really know how should Argentinian food be like as I have never been to Argentina but as long as it’s good, who cares. Lets take a look at how interesting the brunch is. 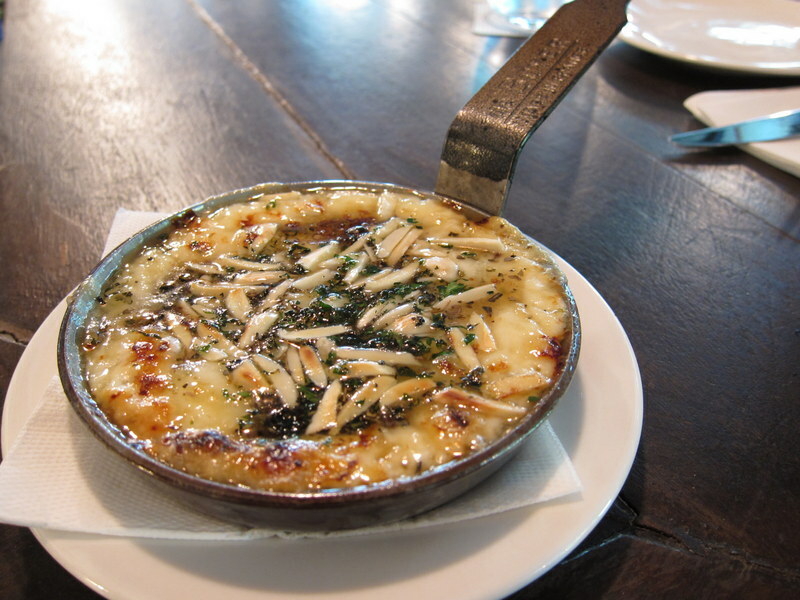 We got the provoleta with honey and almond. I am not a big fan of cheese but this cheese is just so good. It doesn’t have an overpowering cheesy taste like what you get in pizzas. It’s quite light and yet very chewy, tastes slightly similar to halloumi. Together with the honey, it tasted heavenly. Slightly sweet, yet savoury, this is a good starter to whet the appetite. The almond bits also added the crunch to this dish. $17. 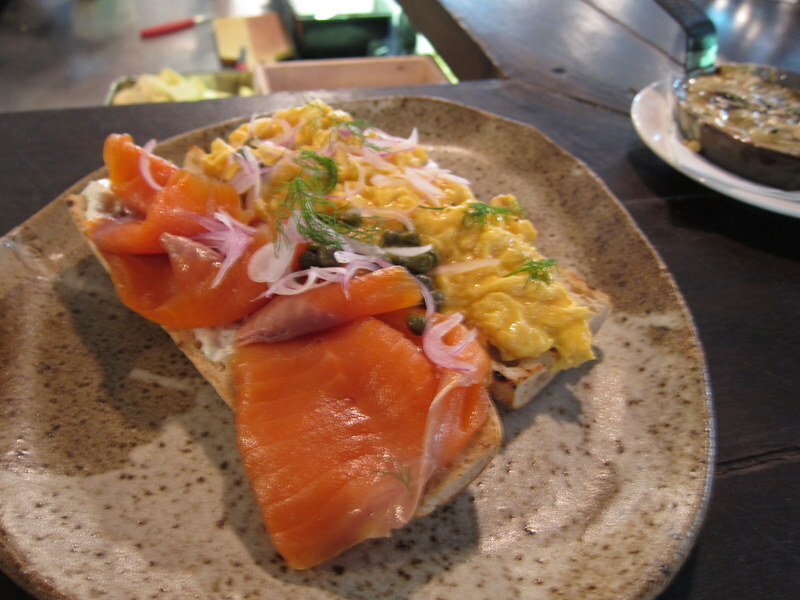 Smoked salmon and scrambled eggs with red onions, dill cream cheese. Sorry for the blurry picture but I guess I was too excited at eating them up that I forgot to check its quality. This was an exciting sandwich as the different tastes complement each other really well. I don’t really like smoked salmon that much as they usually have a slight stench if it isn’t fresh but this didn’t have any and felt really fresh. The meat was thick and has a slightly springy texture to it. Very good smoked salmon sandwich there. The scrambled egg was so fragrant as it is not overpowered with butter and is really soft yet not gooey. Very delicious. $20 ish. And this is churizo sausage with braised ox cheeks and caramelised onions. This dish was again SO good. 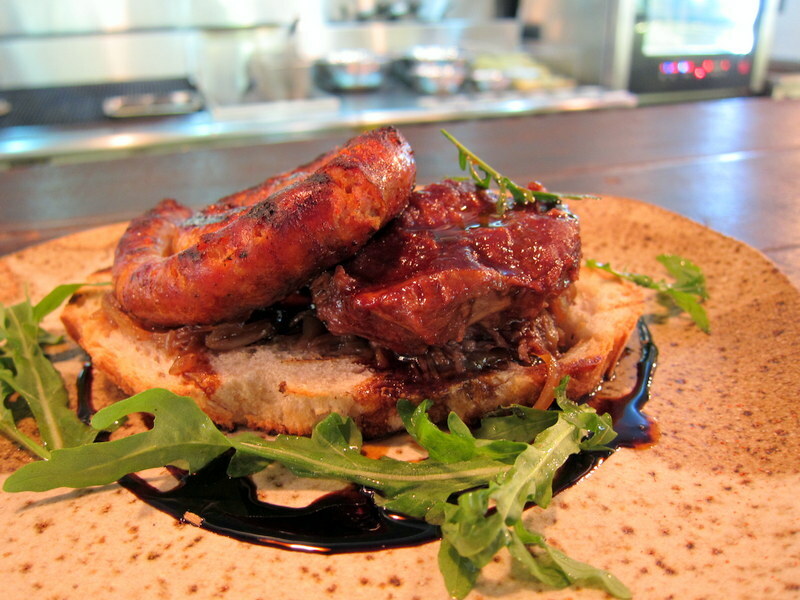 Churizo sausage isn’t overly salty while the ox cheeks are so soft that it melts in your mouth. The meat just falls apart easily when you bite it as it is super tender. Sauce used also gives it an umami kick. Very good open sandwich here again. $20 ish. 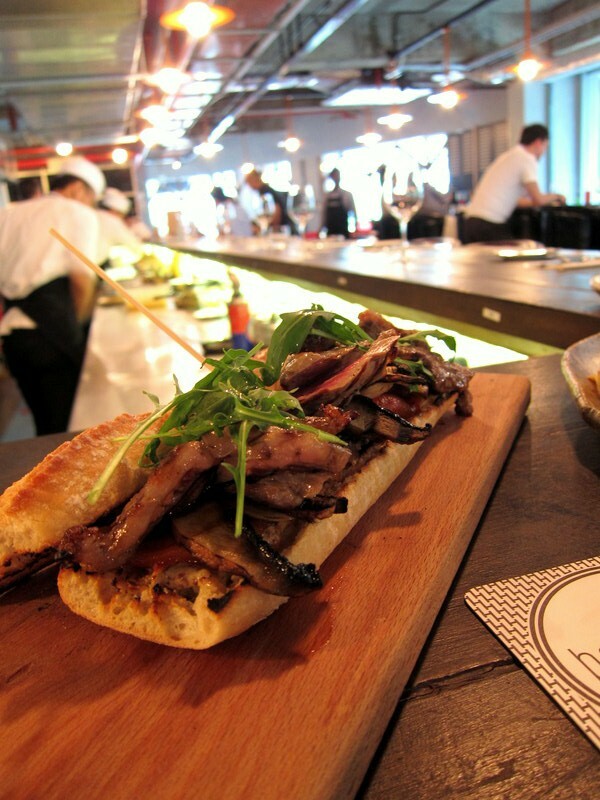 I saw the chef making the Argentinian steak sandwich and we immediately ordered it. A generous serving of beef and beef wasn’t overcooked at all. Still slightly red in the middle, the beef is really tender and delectable. I also love the portobello mushroom and peppers underneath it. Peppers are slightly sweet and caramelised while mushrooms are springy in texture and super delicious. Very delicious sandwich here. $29. 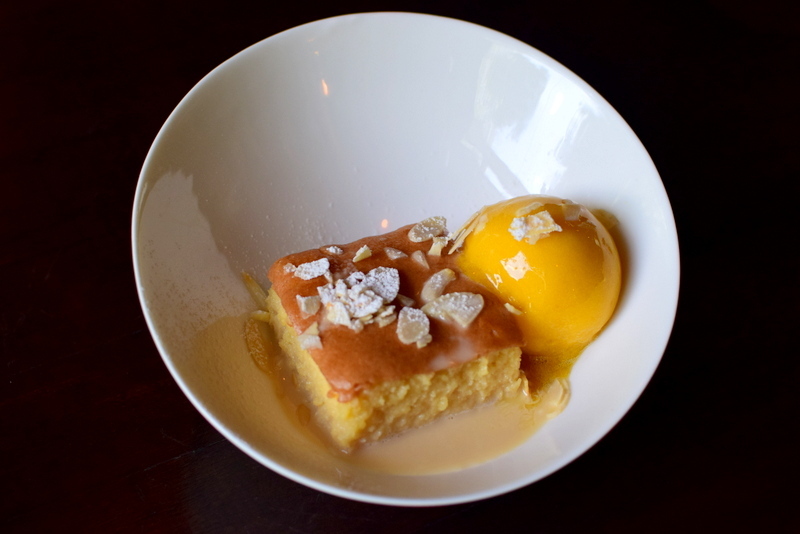 Brioche french toast with peach, lemon curd, toasted almonds and vanilla ice cream. This is definitely a calory bomb but is so good again. Brioche isn’t very doughy as I think egg is a main component in it. Instead it’s really soft and slightly springy. Love the texture. The lemon curd and peach went really well together and you will just want to have more. The ice cream was also smooth and delicious. Creamy yet not overly sweet, this is a dessert that I would recommend greatly! 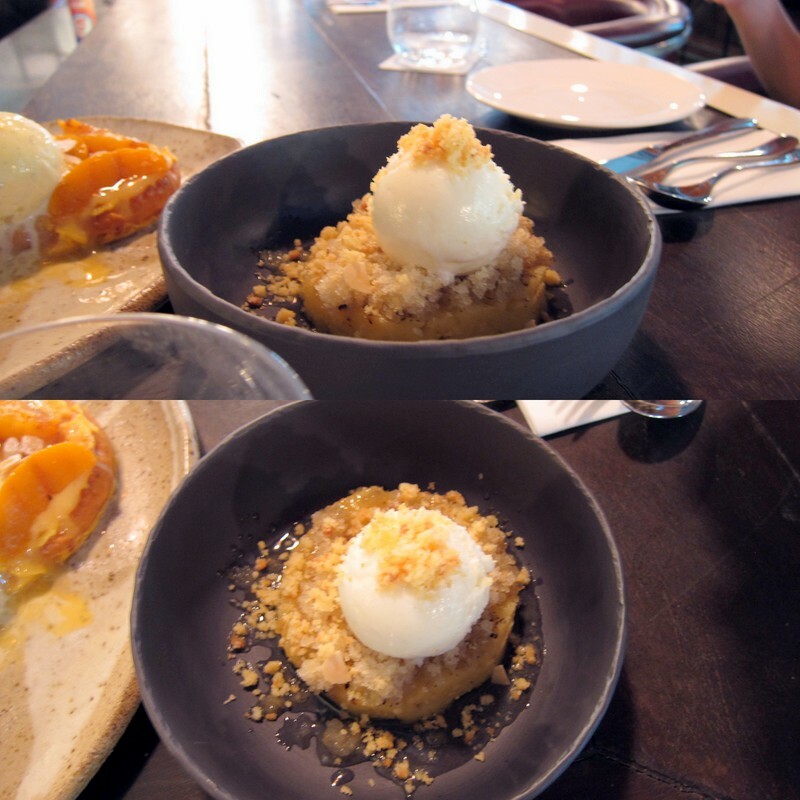 The other dessert was grilled pineapple with apple crumble. 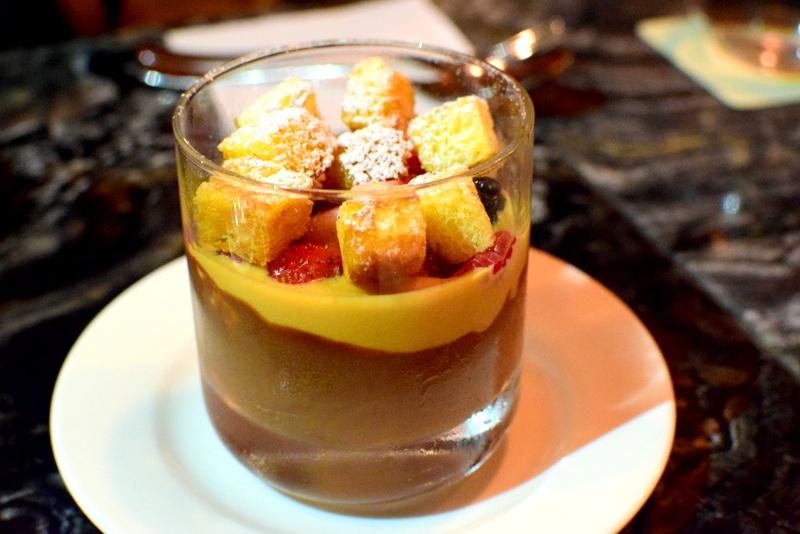 This dessert is good too as it has a lot of textures to it. The slightly different taste of each component complements each other very well to give a final distinctive taste. Yummy. 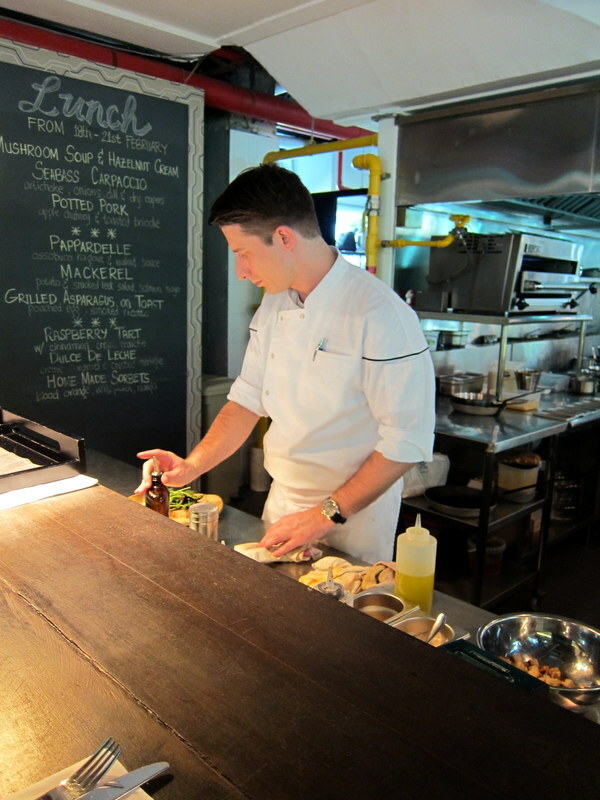 The chef busy plating his food. Great chef here! So, it was G bday today and we treated her to this restaurant. As a typical brunch lover, she agreed that this is the best brunch she ever has had. The whole meal isn’t costly too and is pretty filling. A filling meal here will set you back by about $50 and it’s worth every cent spent really. They also serve lunch which is totally different from the brunch menu and I was told that they would change their menu weekly. I am always excited about chefs that do not repeat their menu as it shows their dedication to food and their commitment to creativity. This is really a good addition to the cafes or bistro here and definitely sets the benchmark for a good brunch. I have never wanted to go back to the cafes that I have visited previously for more brunch stuff but Bochinche is one that I know I will be back again. Bochinche is an excellent restaurant indeed!